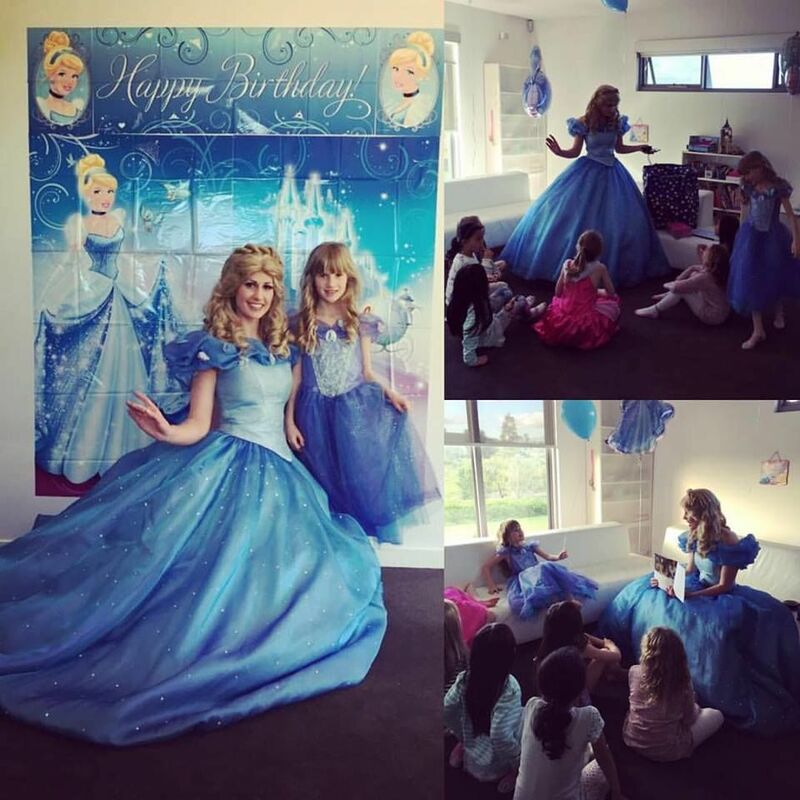 "Given the absolute obsession Poppy has with Princesses, I did an Insta-search for princess parties in Melbourne to get some ideas. 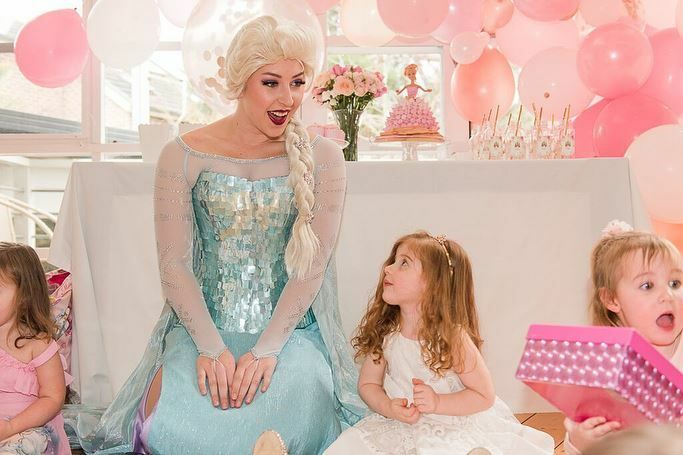 Magical Princess Entertainment popped up in the search and, given Poppy had already asked me if she could invite a her favourite Princess to her party, I decided to lock in ‘The Snow Queen’. 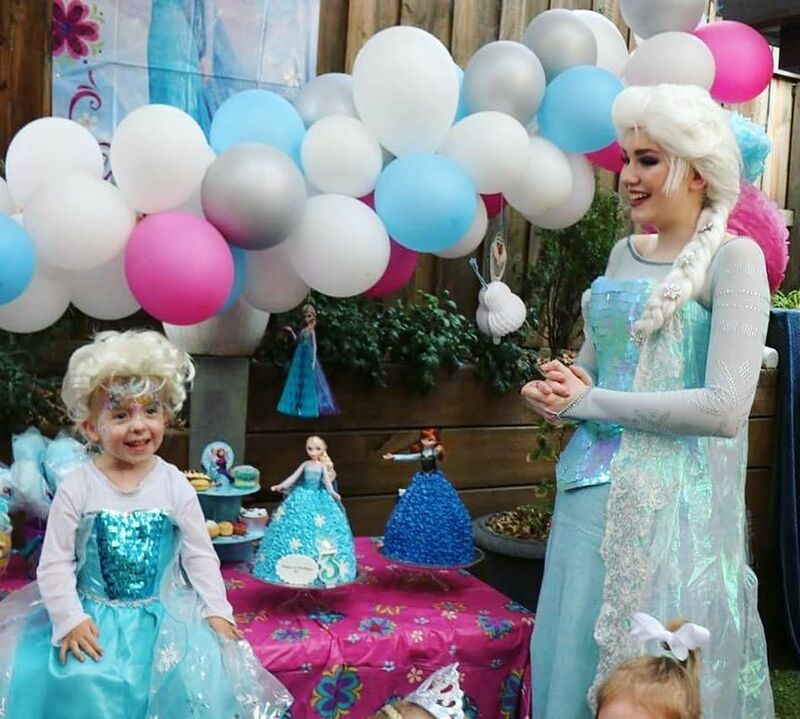 I didn’t tell Poppy that The Snow Queen was coming to her party as I wanted it to be a surprise. I gave other parents a heads up she was coming in case their kids hadn’t seen the movie and wanted to watch it beforehand. I couldn’t wait to see Poppy’s reaction when she opened the door on the day. In the end, her reaction was not what I expected. 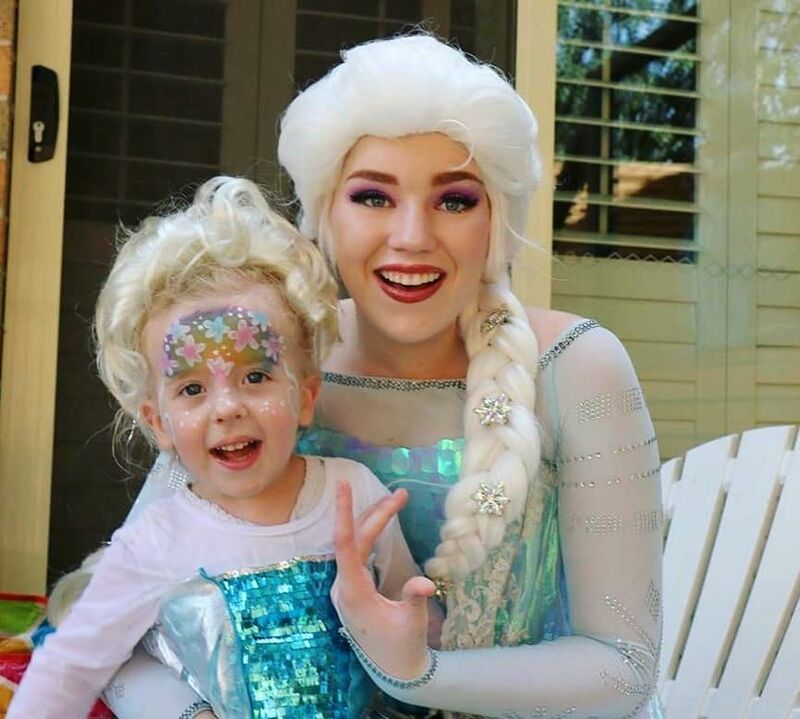 She answered the door and was totally cool and calm as she explained “I’m three!”…like she totally expected her dream to come true. When you use this company you book the character, not a specific entertainer and they contact you a few days out to check in and reconfirm the details. Our entertainer was absolutely stellar. 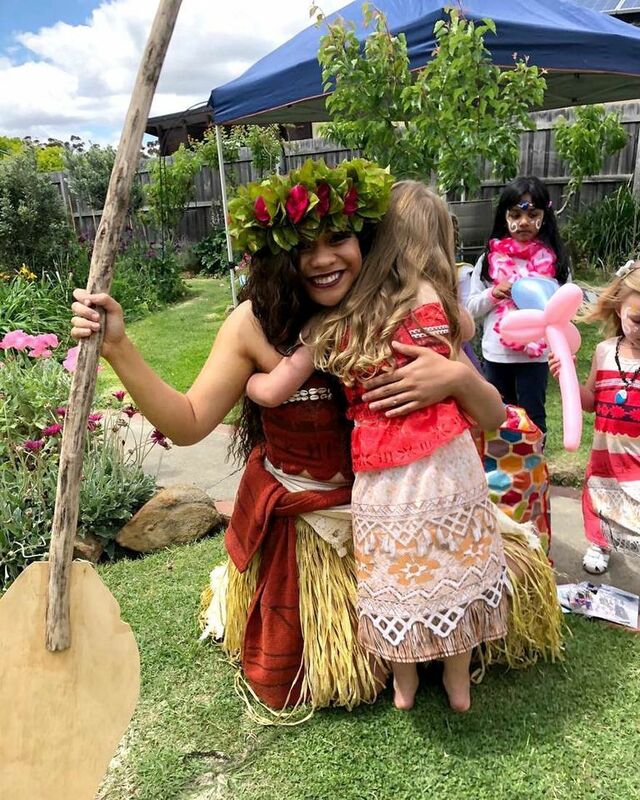 The children adored her and parents were also singing her praises. I fully expected to be helping her for the 1.5 hours she was at our house but from the time she walked in to the time she departed, she constantly entertained the kids solo without blinking an eye. Her voice was beautiful and she wasn’t phased by anything (cue random balloons popping mid-song!). She played pass the parcel, did storytelling, sang songs, played with a parachute, twisted balloons and painted faces. She was a woman of many talents!" 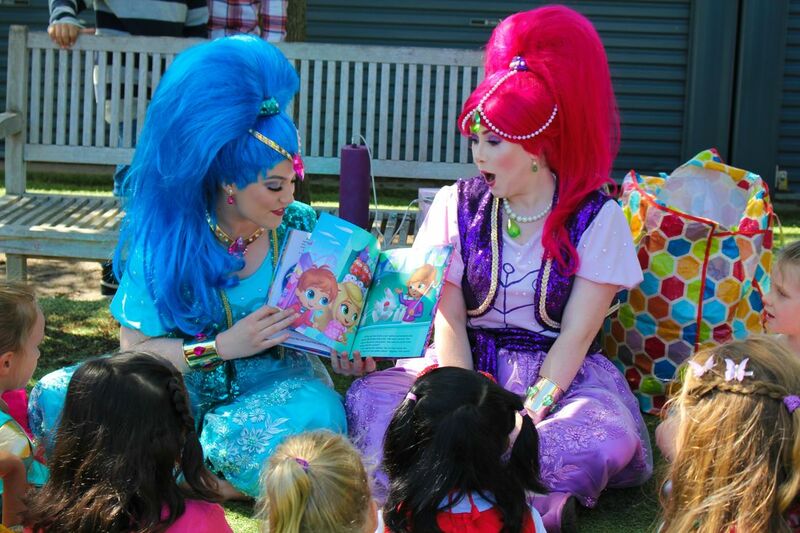 I am so happy with quality of entertainment provided by the Mermaid Princess at my daughter's 6th birthday party. 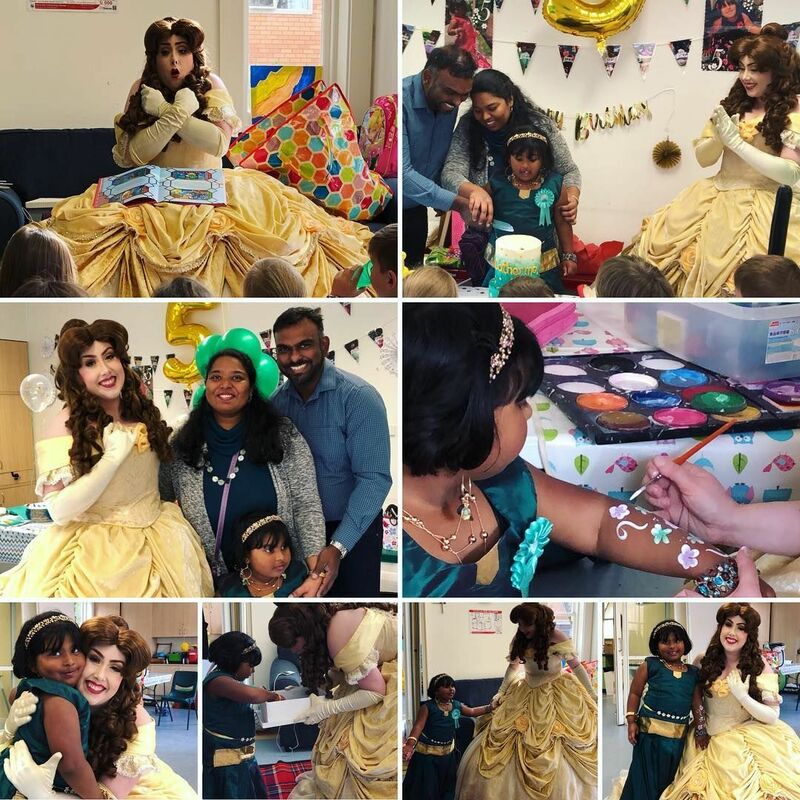 It was a truly magical experience for all the children, they were mesmerised and completely enthralled with her, playing games, story telling, singing, balloon twisting and beautiful face painting. 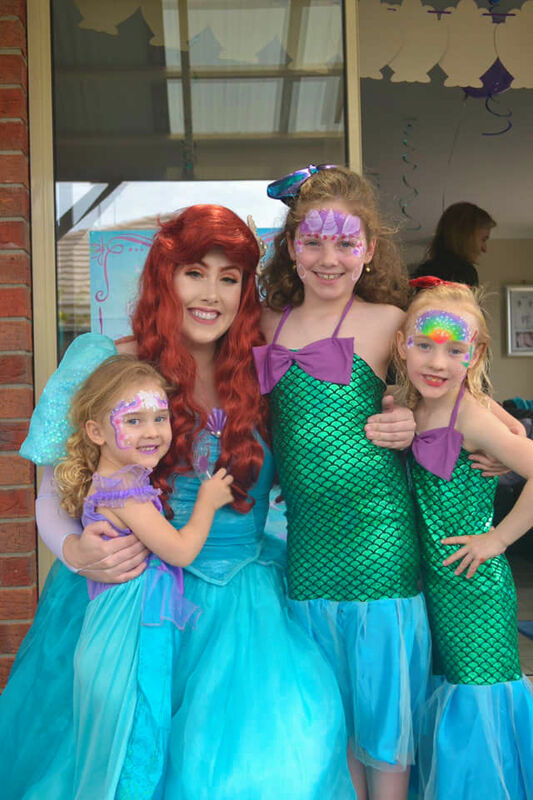 The Mermaid Princess took the the time to make sure she had completed all the children's face painting, stayed for singing the 'Happy Birthday' song and pose for photos with the birthday girl and her friends - which ran outside of our package time - thank you to the Mermaid Princess for creating such a memorable experience, it was fantastic! 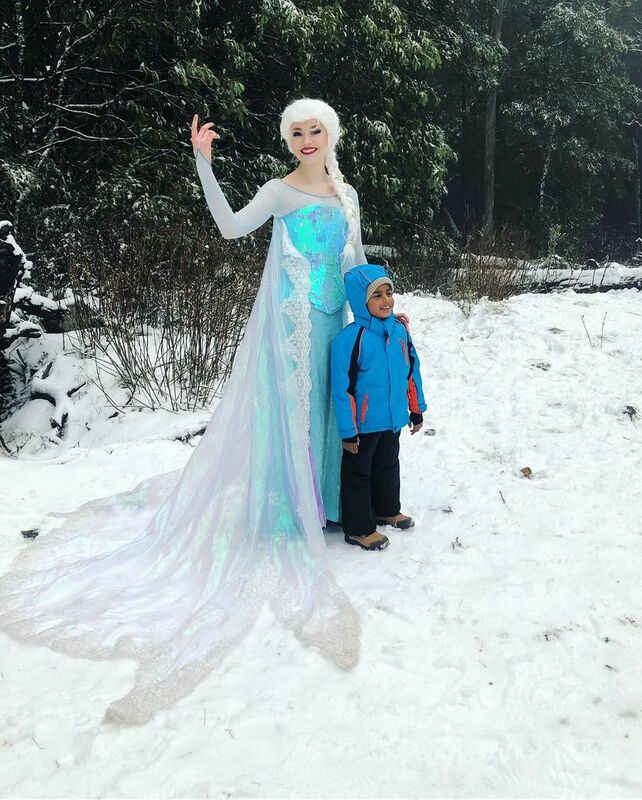 The Snow Queen joined my little one on his first trip to the snow! 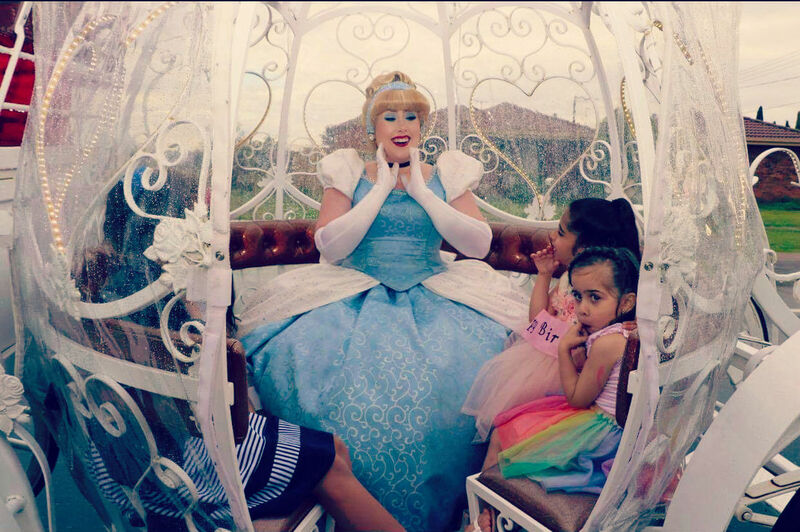 It was magical and the memories would last a lifetime! Emily went above and beyond to make this dream come true and I can only make the highest recommendations for her and the team. 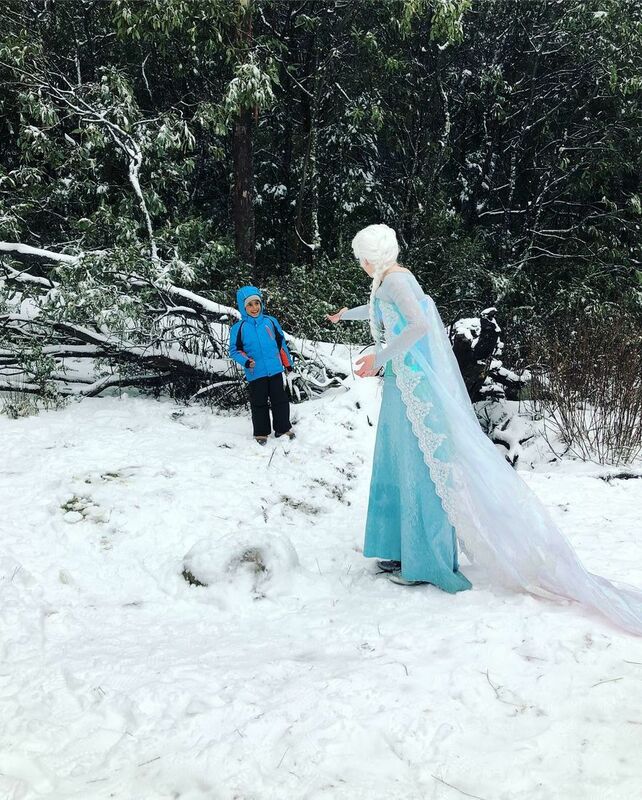 The beautiful Snow Queen was in her character regardless of the cold, and sang in perfect pitch, not once but twice. The whole experience of working with Emily was very professional and easy going from the beginning. Five stars to the team! 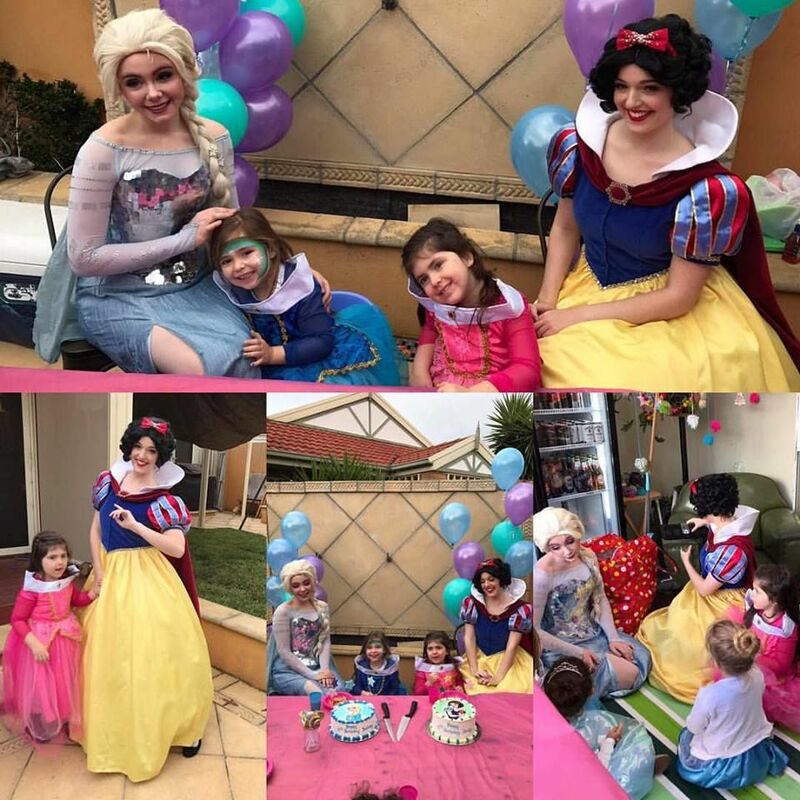 Thank you Magical Princess Entertainment for doing your magic again! 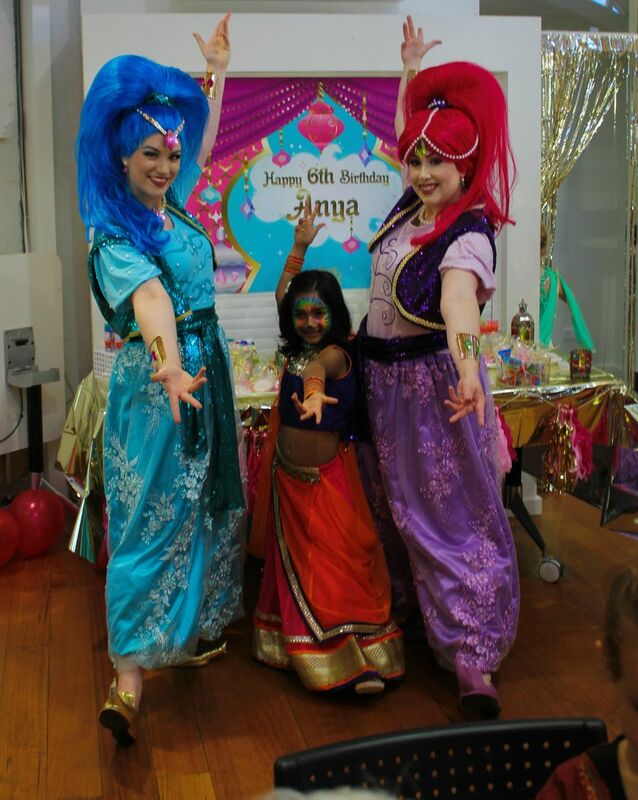 The Genie Sisters did an amazing job at Anya’s 6th birthday. 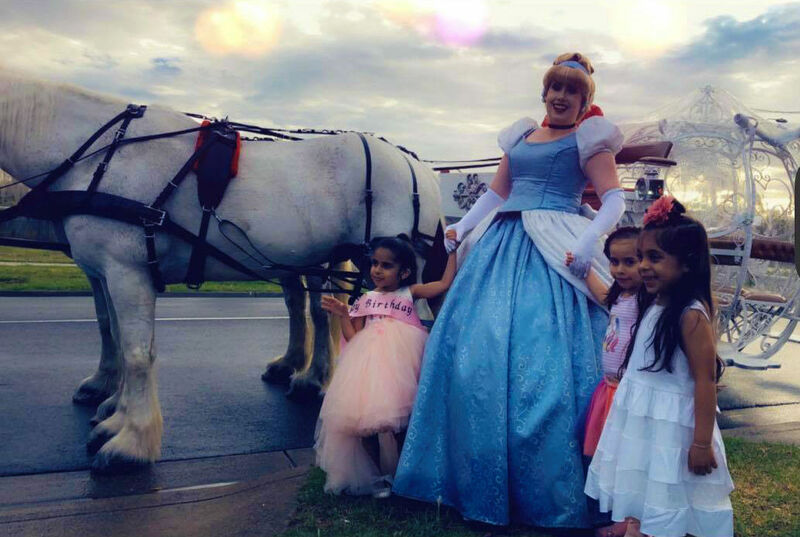 They were on time with FANTASTIC outfits and captured the kids attention from start to end. The kids had a great time with the activities planned and were kept engaged the whole time. Thanks again! 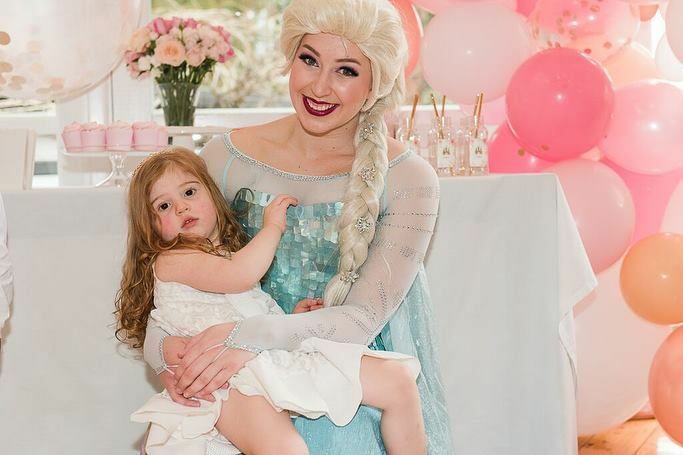 Zoe had a truly magical 3rd birthday party on Sunday with the Snow Queen. Thankyou! 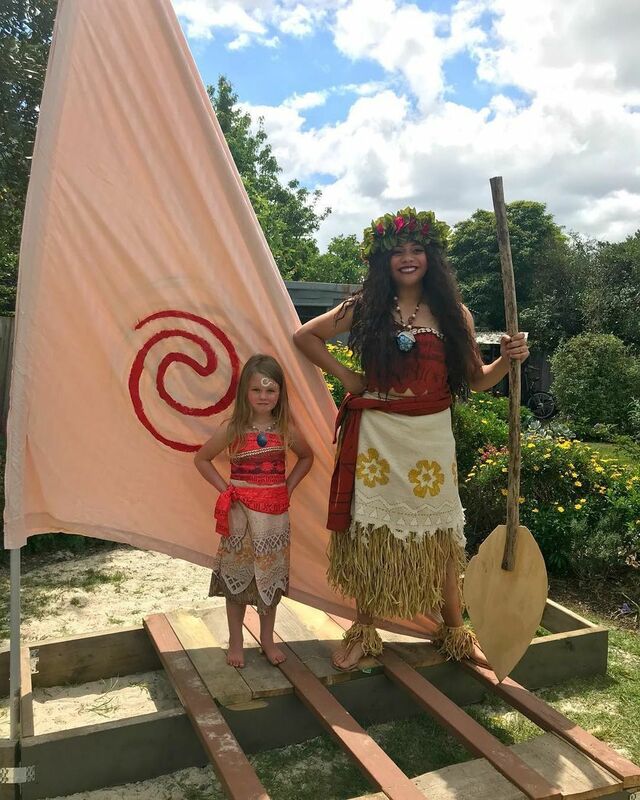 Just wanted to pass on my thanks to The Island Princess for coming to Anouk’s party on Saturday. 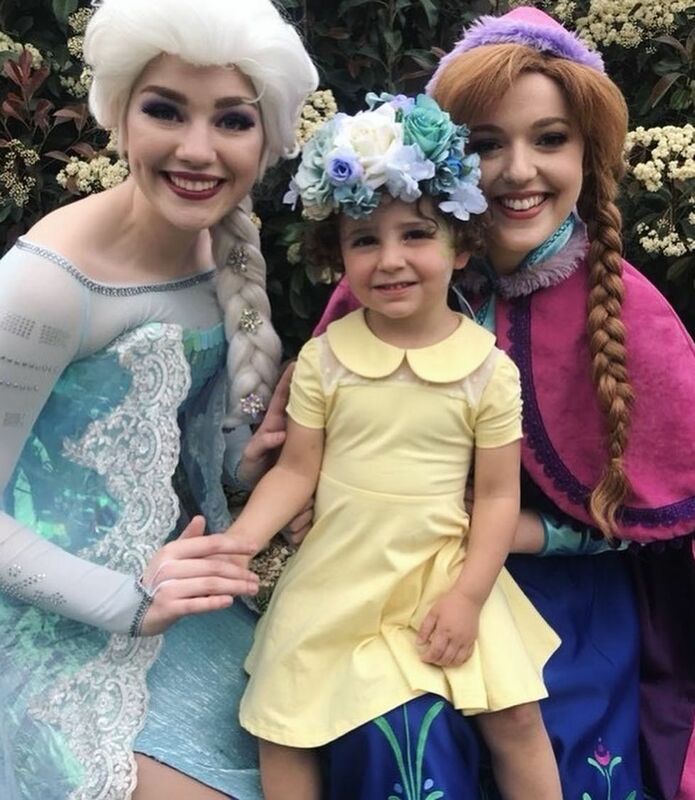 My daughter was in awe of her and had such a magical time!!! 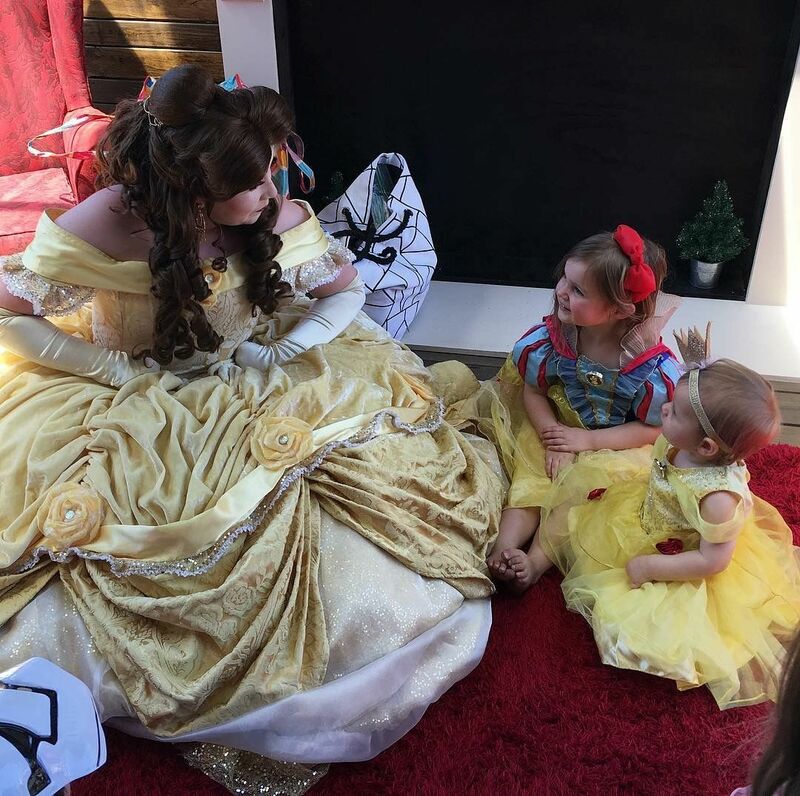 "Thanks so much to Beauty from Magical Princess Entertainment for entertaining the kids at Sofia’s Beauty and the Beast 1st Birthday Party On Saturday. The professionalism from when Beauty walked through the door to the moment she left was spot on. 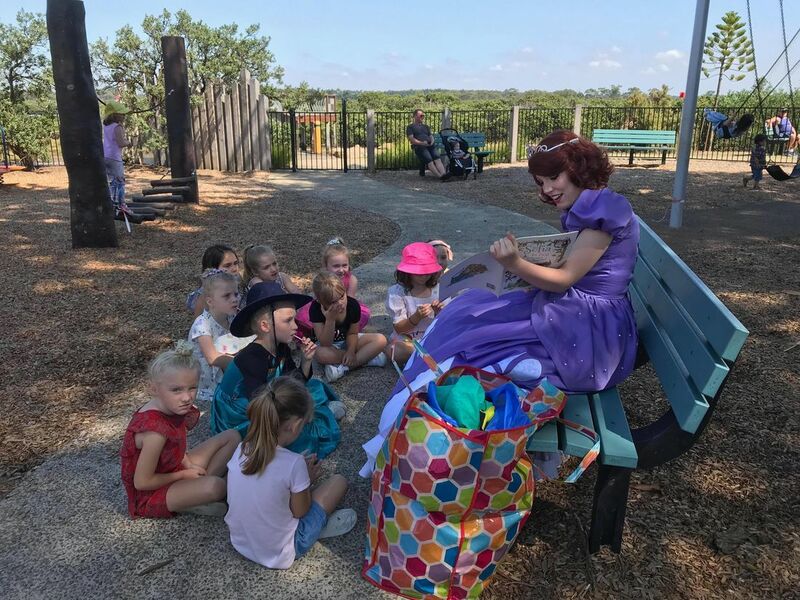 She stayed in character the entire time, read a gorgeous story, sang beautifully, played party games, had a parachute, made balloon characters and kept my daughter in AWE the whole time she was here. 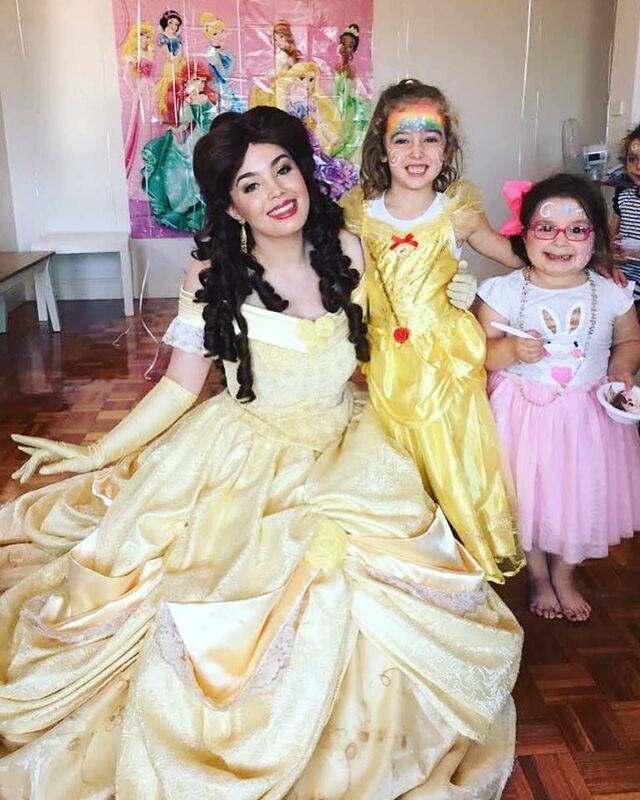 I certainly recommend anyone with a love of children’s characters to hire Beauty or one of her amazing team of other singing princesses to entertain your children at your next kids birthday. AWESOME job you really completed our party set up amazingly. Thank you so very very much." 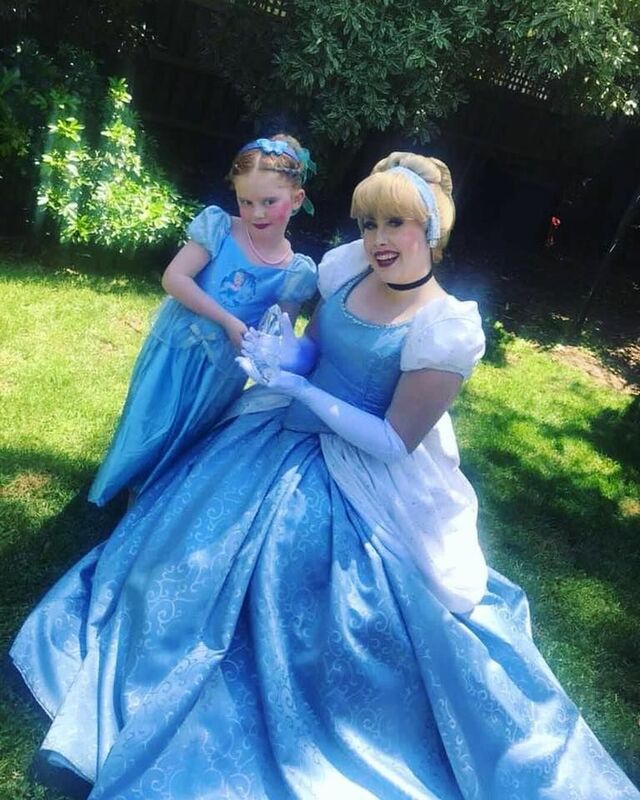 Thank you so so much to ‘The First Princess’ for making my daughters 6th Birthday truly a Magical day! Couldn't of asked for anything more perfect, she was absolutely outstanding!!! All the kids just LOVED all the games and activities she played and they also got a balloon to take home too!! 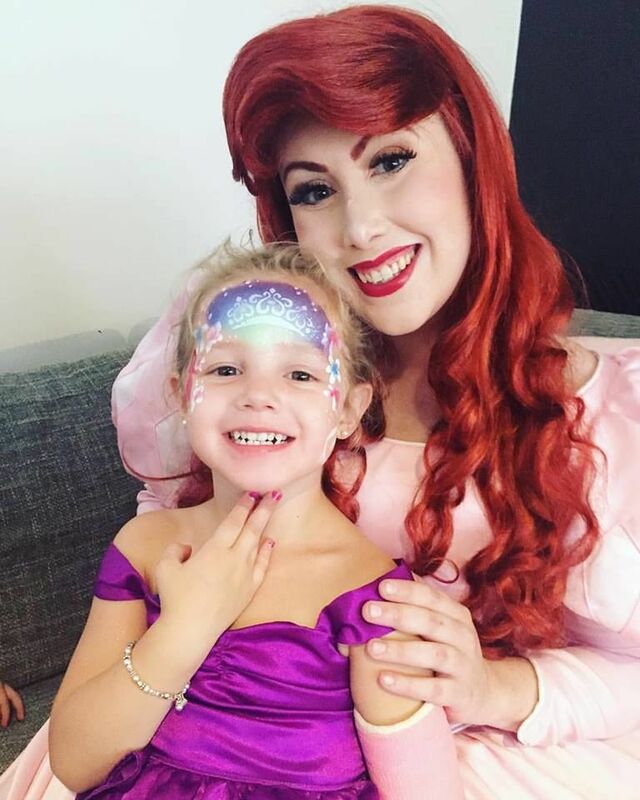 She stayed in character the whole time and might I add she was just stunning as well, every single parent at the party has asked for your company details, I wouldn’t hesitate to book you guys again in a heart beat. I cannot recommend this company enough, they are true professionals and honestly the best in the business. For anyone hesitant to book, don’t be! They are worth every cent! 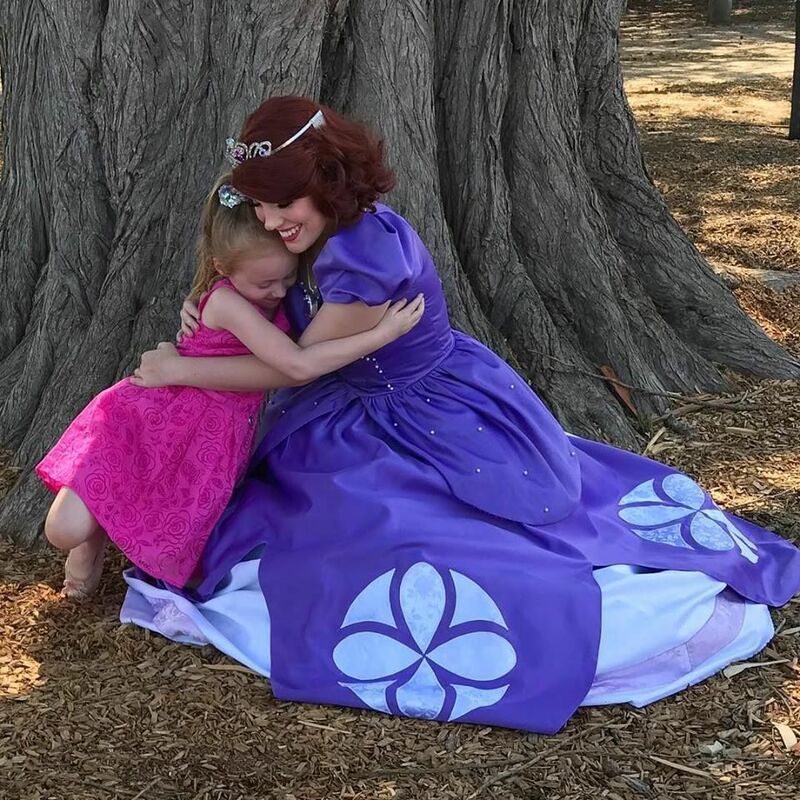 Magical Princess Entertainment will honestly make your child’s dream come true. My daughter is just over the moon and won’t stop talking about it. 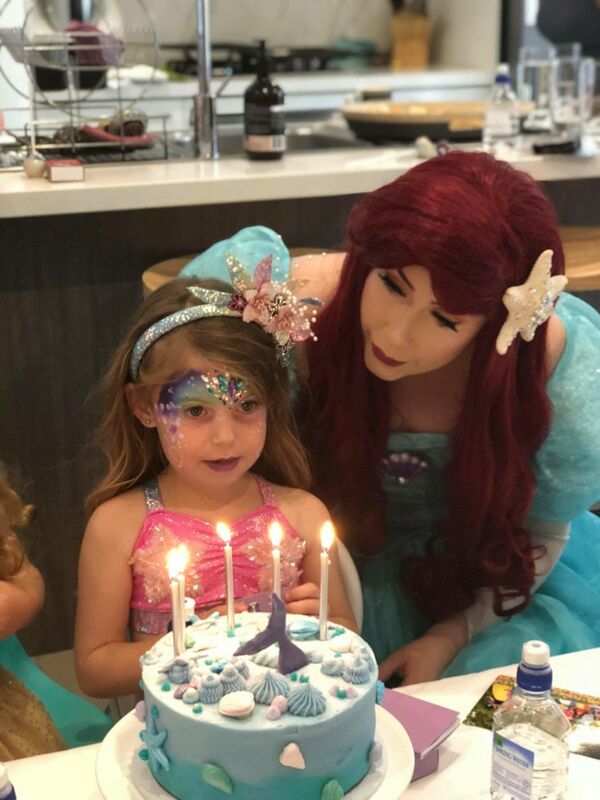 Thank you Thank Thank you Magical Princess Entertainment from the bottom of my heart. 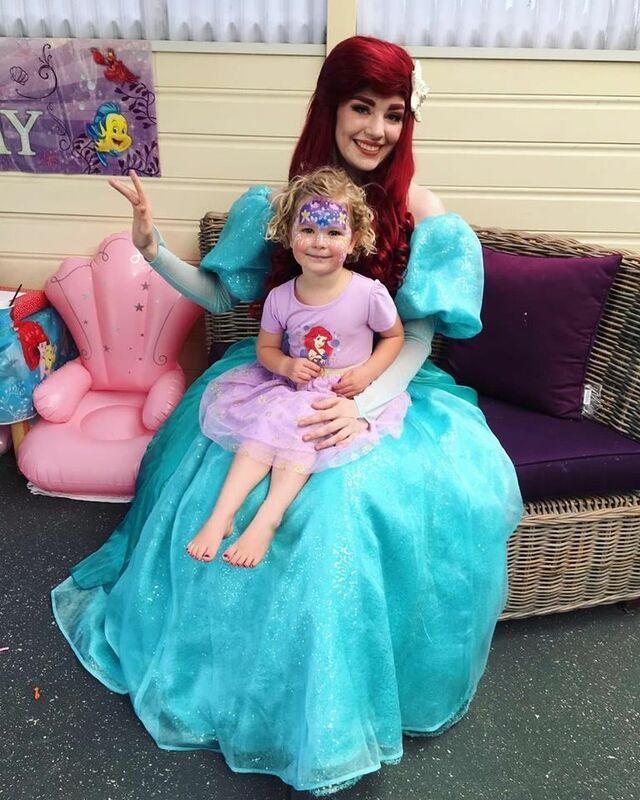 This is my daughters second Magical Princess Entertainment party and we were again blown away. 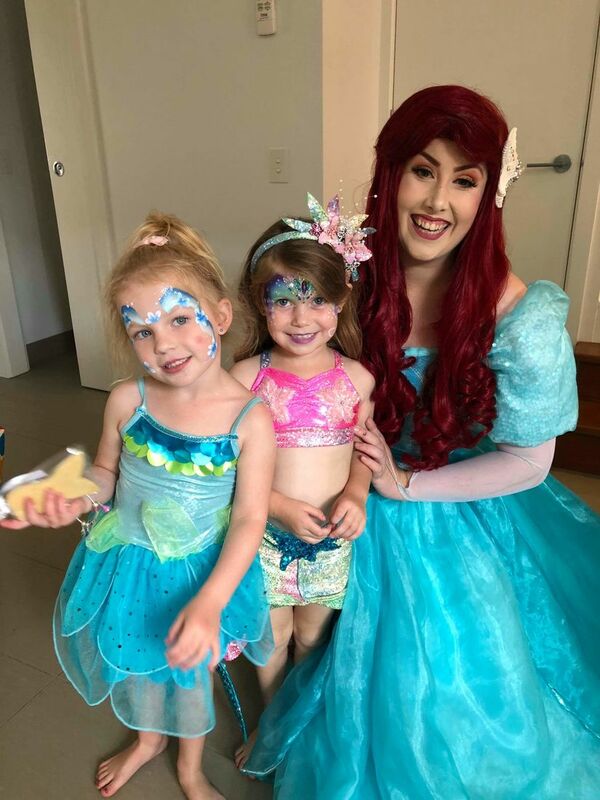 The Mermaid Princess was amazing, entertained and engaged all children and made our little princess feel very special. 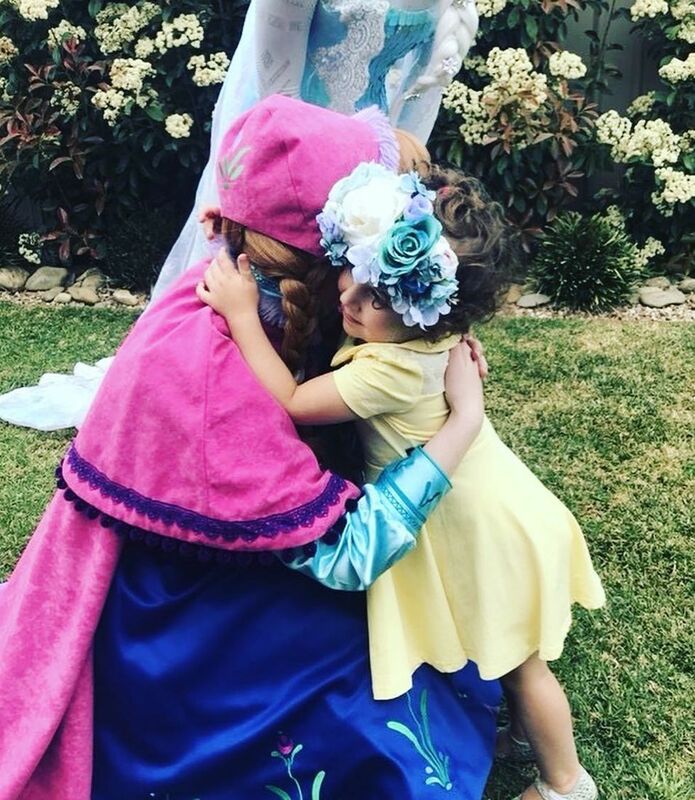 Aurora said last night she wanted the Princess to come back so she could have more hugs and she gave the best princess hugs!! 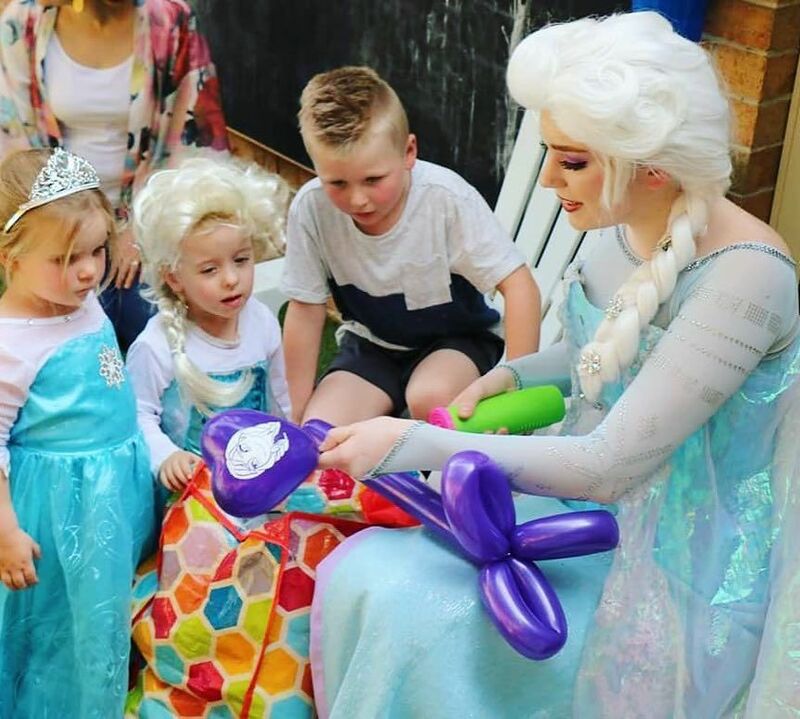 Thank you so much to the Snow Queen for making a magical appearance at our daughters birthday. 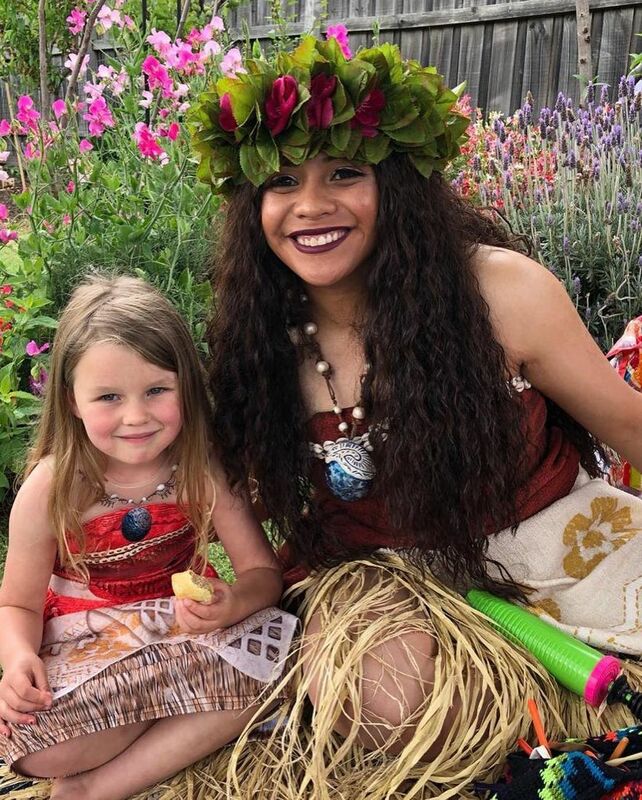 She was absolutely mesmerising to all the children and certainly made the party a spectacular day with both children and adults entertained during the entire show. It was certainly a party that won’t be forgotten any time soon! 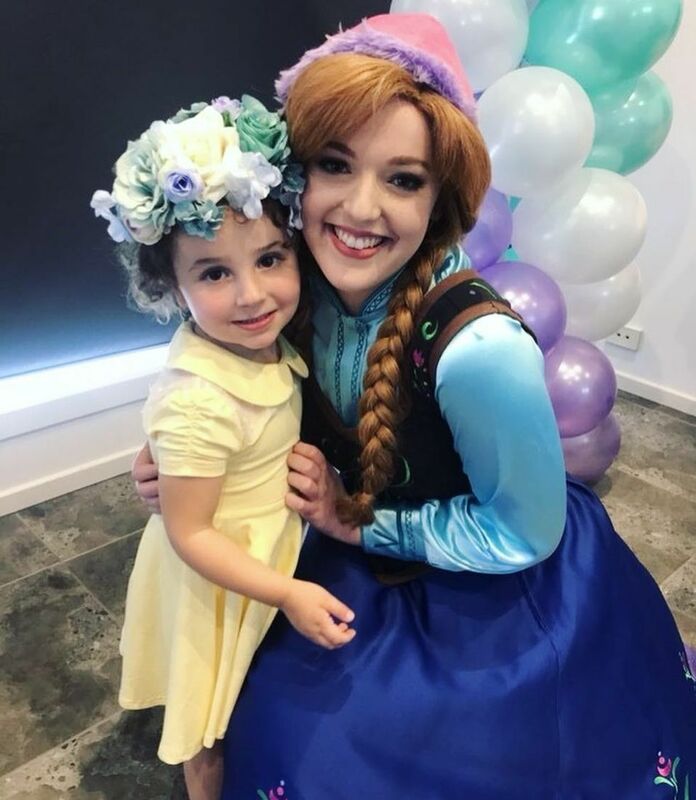 Just wanted to pass on our thanks to The Ice Princess who did a brilliant job on Saturday at Angelina’s birthday party. She was amazing!! 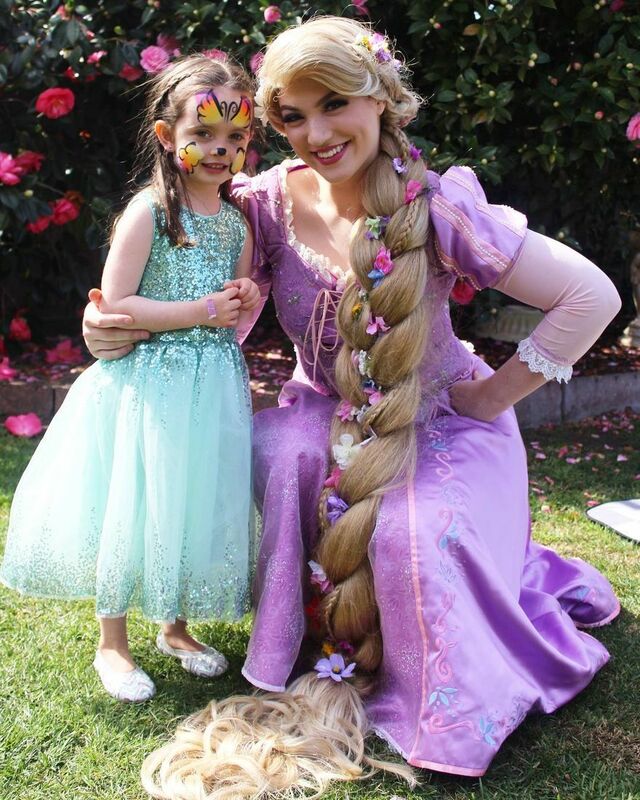 all the kids loved her, especially Angelina, she told me it was the best day of her life! Thanks again for organising. 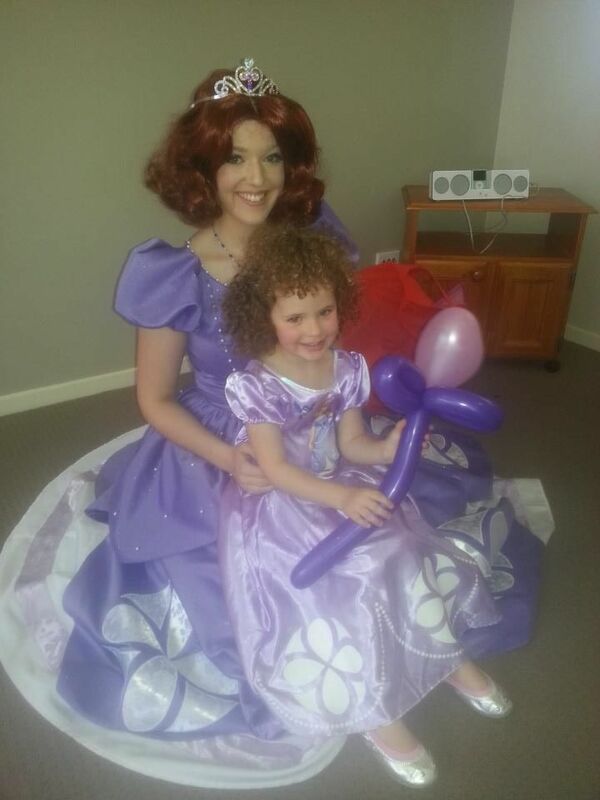 Had an amazing experience with the Hyland Princess today for my 3 year old birthday. She exceeded expectations, came in deed with a Scottish accent and deep knowledge of the story and themes. 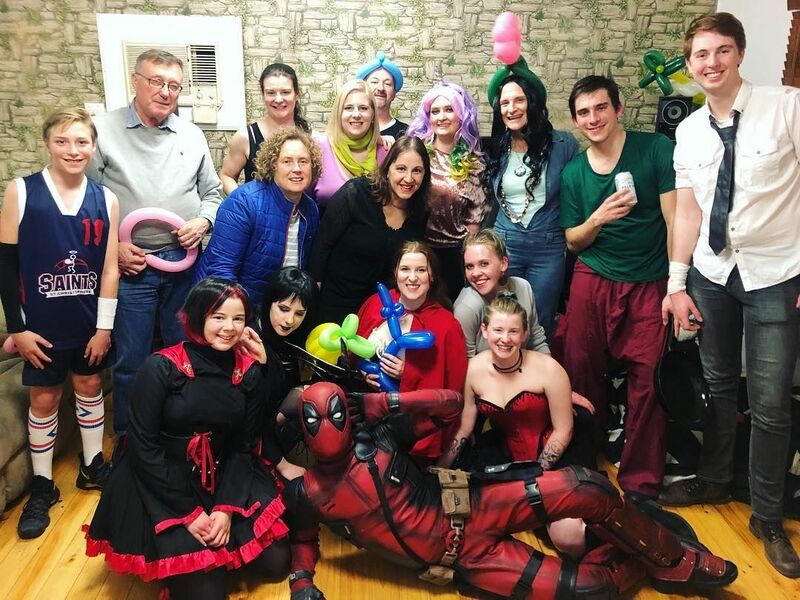 Stayed in character the whole time, sang songs, played pass the parcel, read books, balloon animals and kept the children aged three through to 6 entertained for the hour. 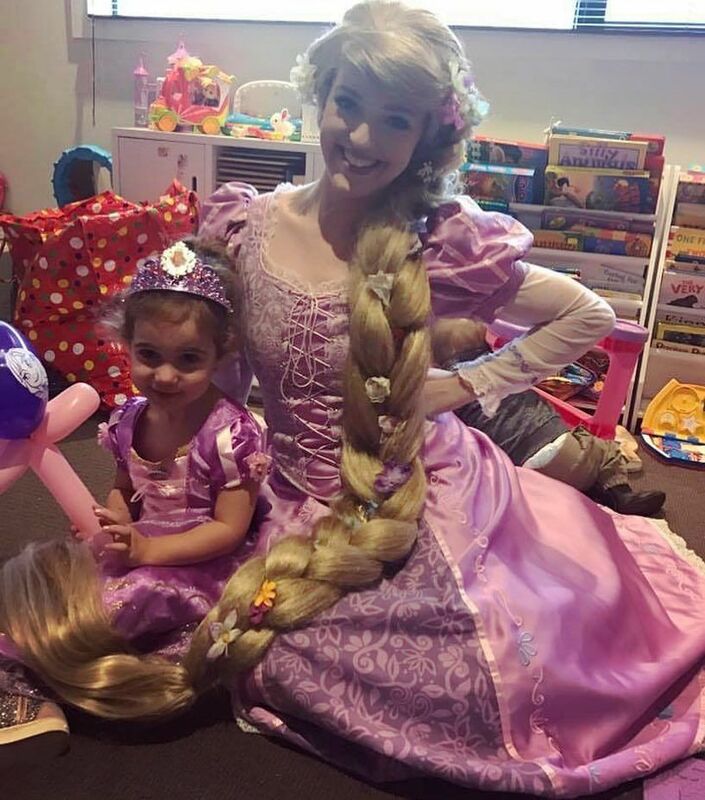 Highly recommend the ladies at Magical princess entertainment. Saw them many years ago at a concert and have always wanted to hire them. Didn’t disappoint. Will be booking again. 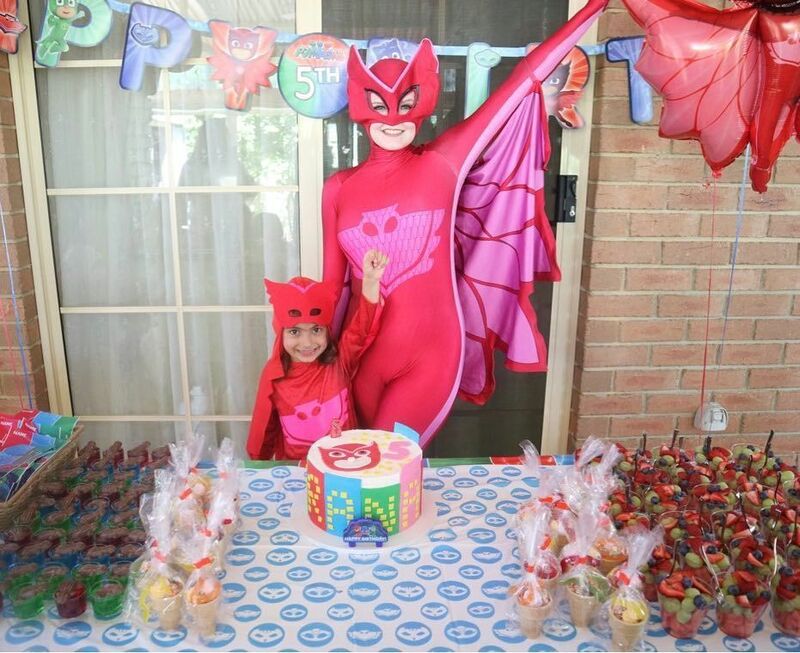 Thank you so much to Superhero Owl Girl. 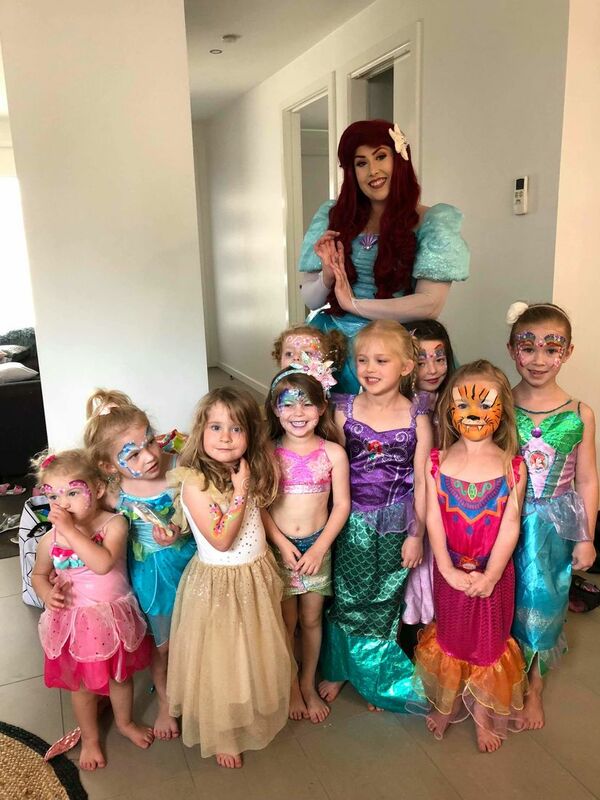 My daughter had amazing 5th birthday and all the kids had so much fun!!! 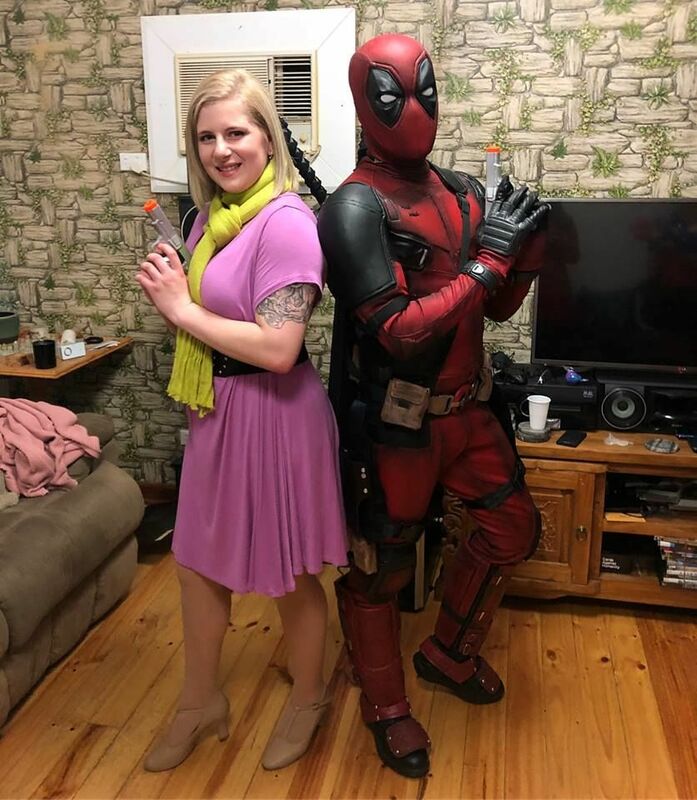 I had my favourite Masked Hero come to my 25th and I have received nothing but positive comments about the night from friends. My mother was up and interacting within minutes and everyone was laughing and having an amazing time, the entire time. The games were well executed and altered to suit big kids. 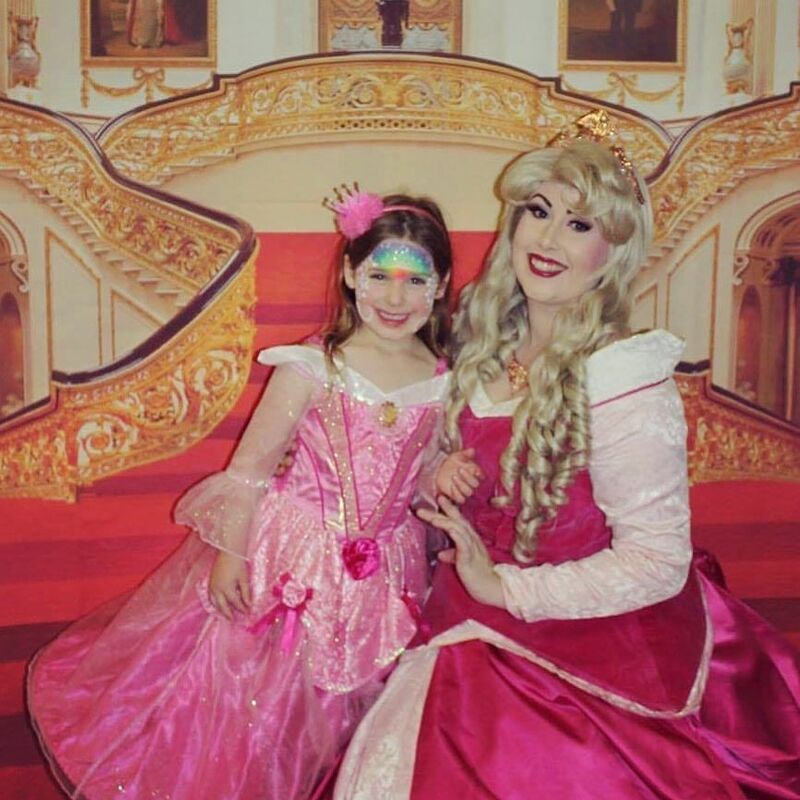 I would recommend Magical Princess Entertainment to anyone who will listen! 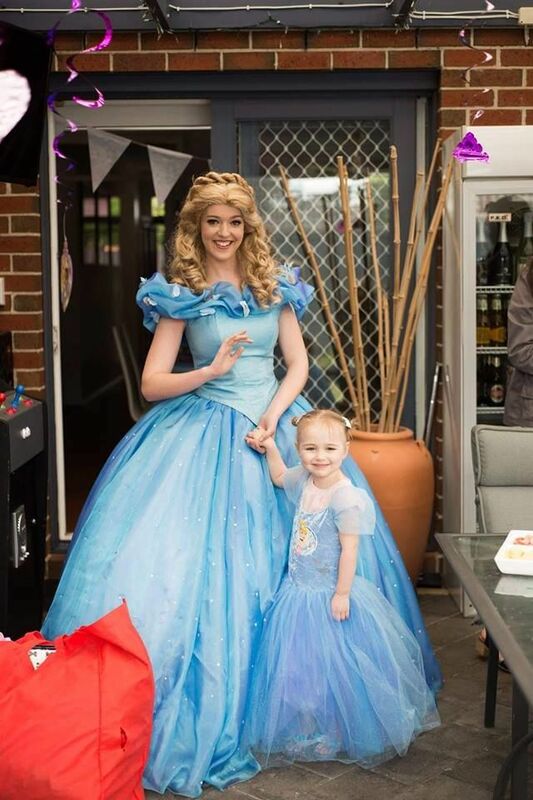 We had the Snow Queen and Pink Princess at my daughters 5th birthday yesterday. They were both so professional and realistic that they had everyone in the room believing in magic again. The mix of characters was so much fun and the way they both bounced off each other’s energy was so genuine, you can tell they love what they do. Having the girls there made for such a relaxing party for me as I just left everything in their capable hands! Thank you so much!!! We can’t wait to see you again! 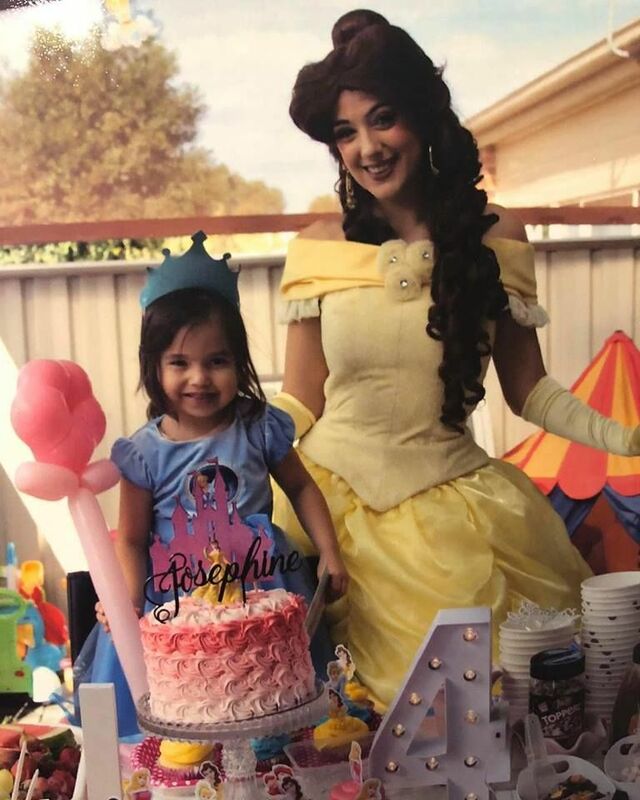 Thanks to Princess Beauty, Catherine had a lovely birthday. 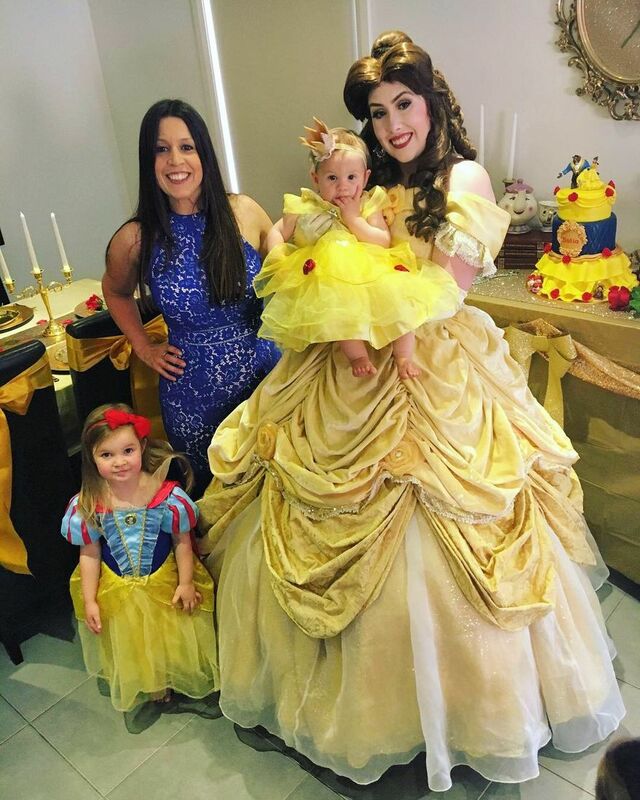 She is still raving about how much fun she had to our friends and family. 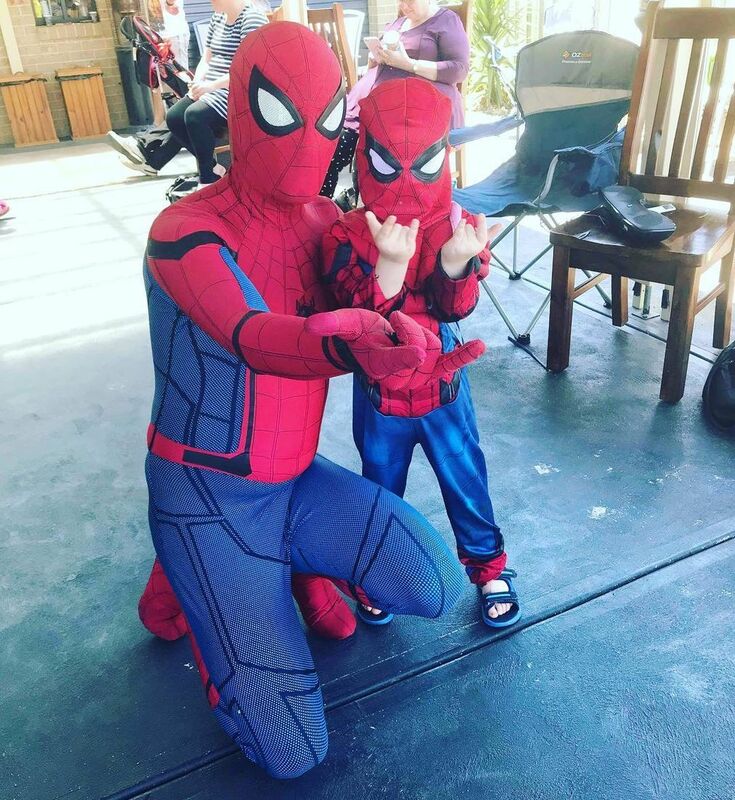 The kids were thrilled and the parents really enjoyed seeing their kids have a good time. You were really wonderful and surpassed our expectations. 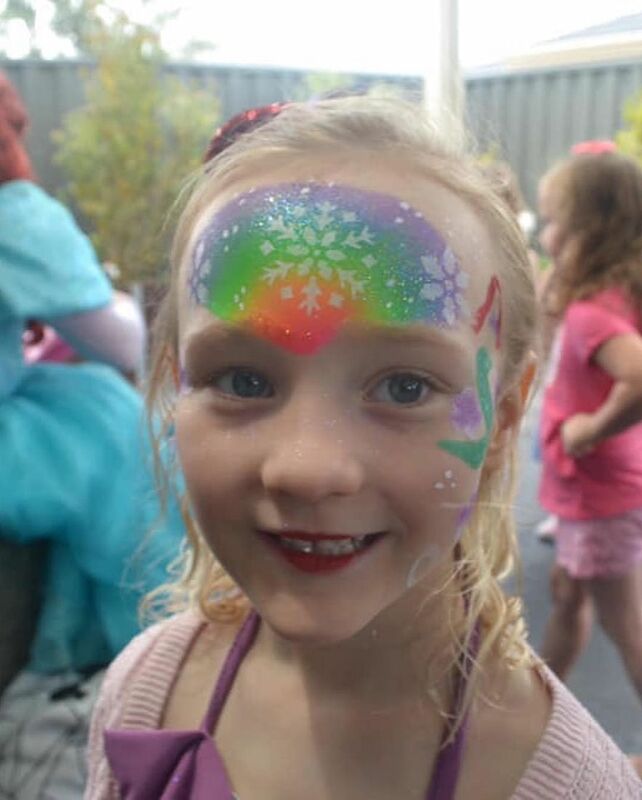 Catherine looks forward to next year and she's already planning who to invite from Magical Princess Entertainment! 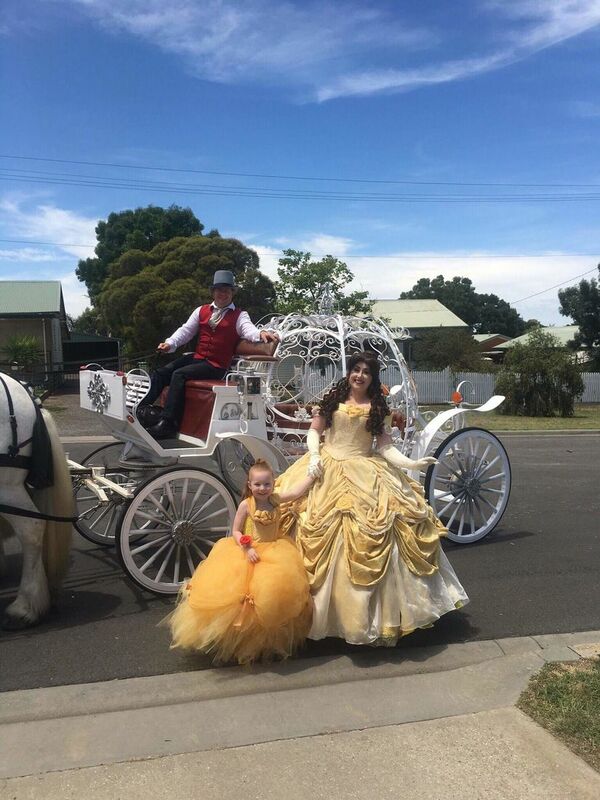 Thank you so much to Princess Cinder and her Horse and Carriage for making my daughters wish come true!! She was absolutely beautiful and a true professional, in character from the moment she walked in until the moment she left. I cannot speak highly enough of the wonderful entertainment provided at my daughters birthday party. 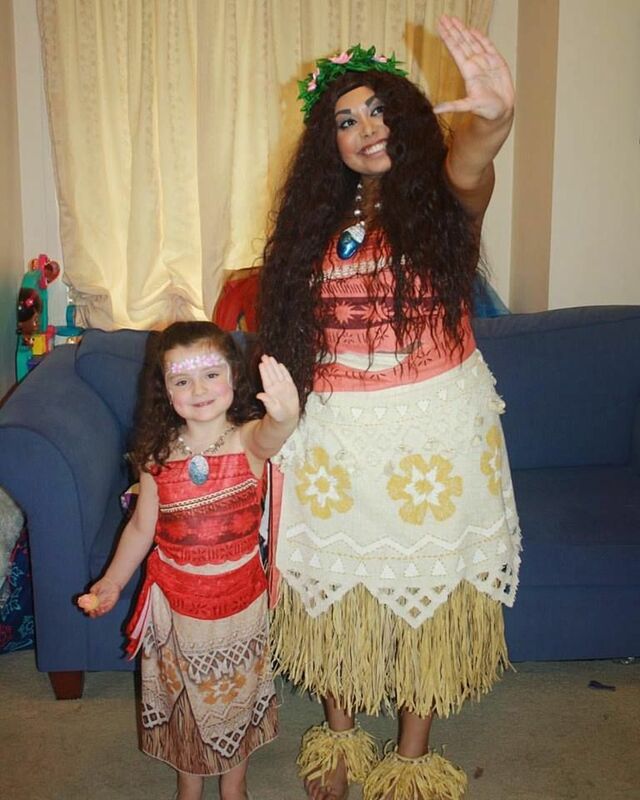 The singing, dancing and face painting were beyond amazing!! 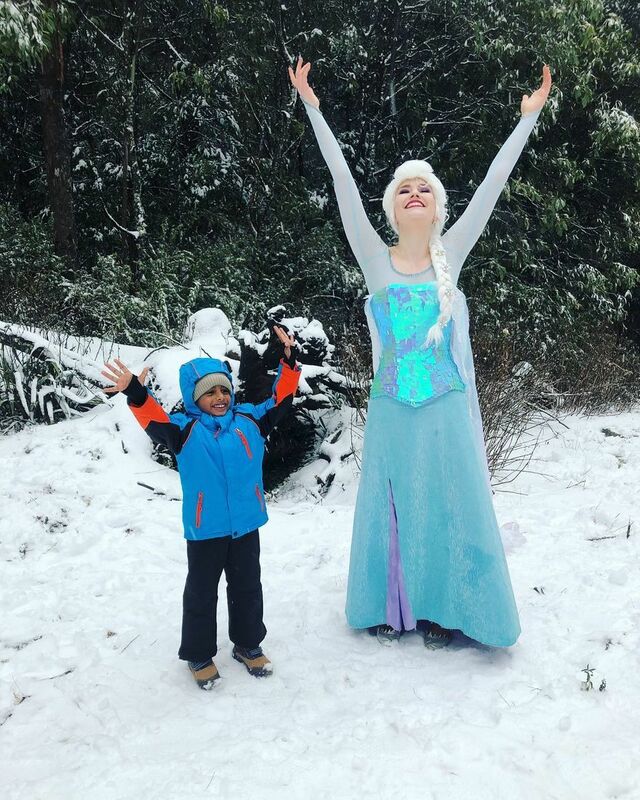 Georgia’s dreams came true the moment the Snow Sisters entered our home. 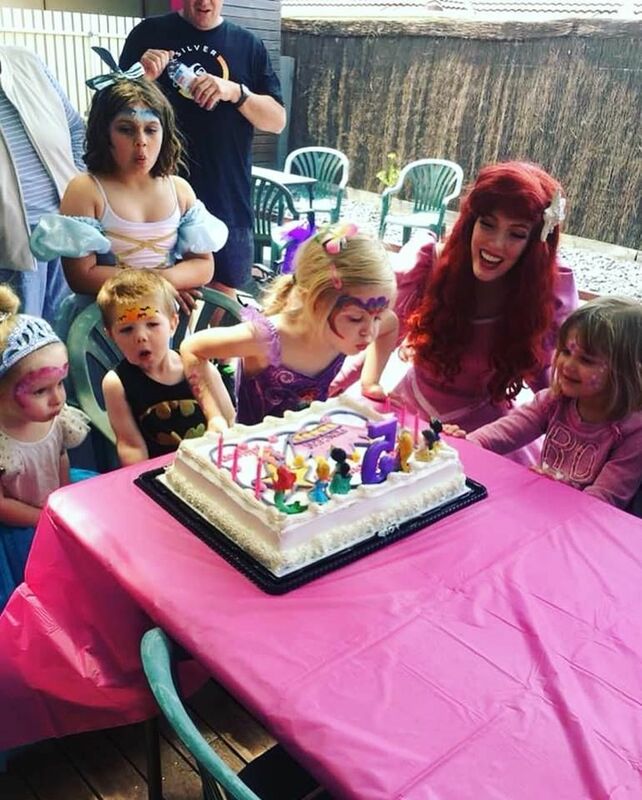 Her day was made even more memorable because of them. Thank you for playing a huge role in making memories with our friends and family! 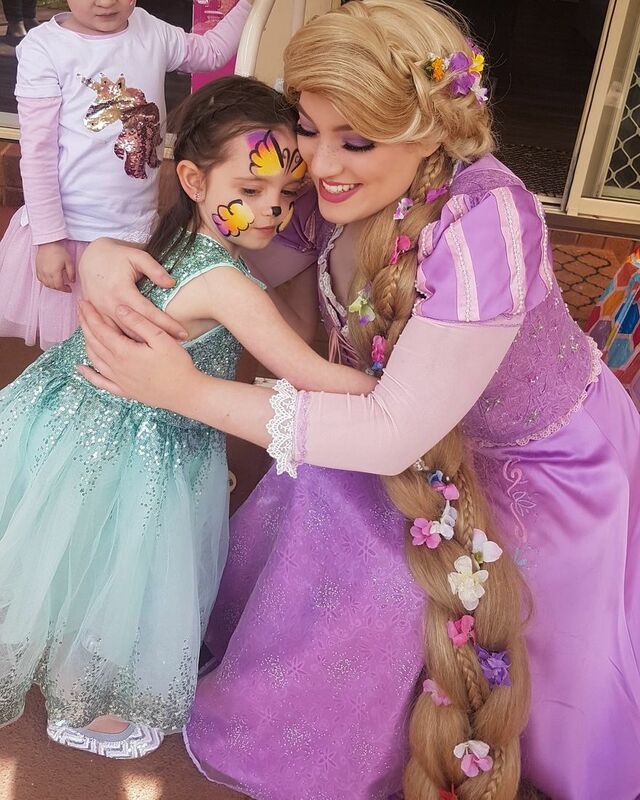 Thankyou so much To the Tower Princess, you were absolutely amazing you truly made Kayleighs day so magical. You were 100% in character the whole time, looked beautiful and what an amazing voice you have. All the kiddies loved you and all the adults were very impressed with how talented you were. 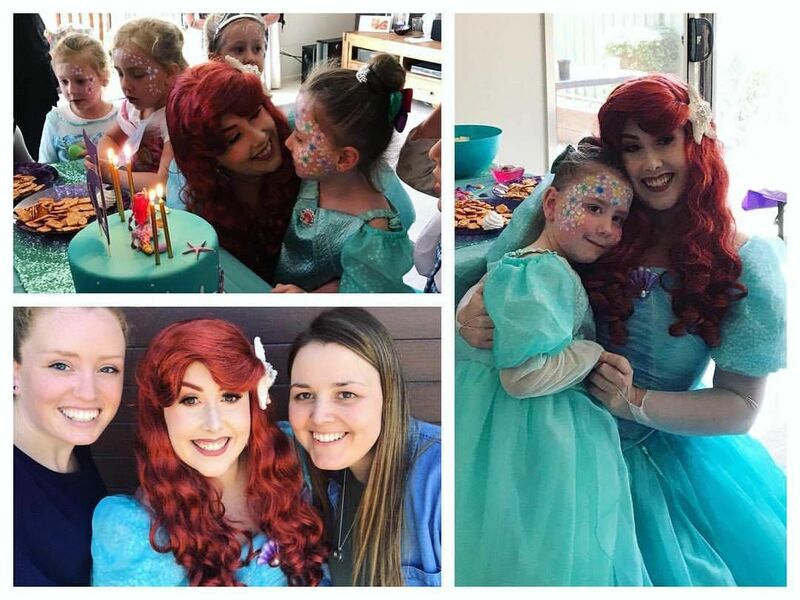 Thankyou so much for giving Kayleigh a birthday she will remember forever!! 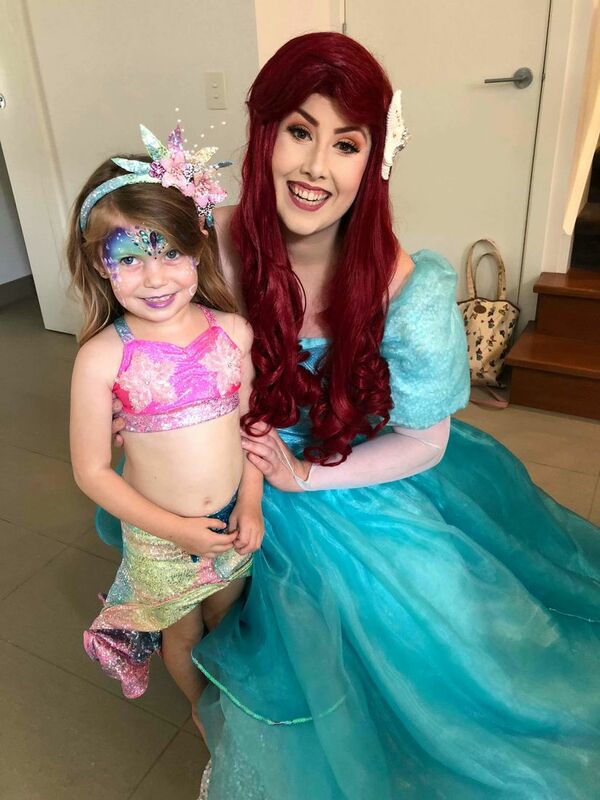 Lots of Kayleighs friends now want princesses at their parties. I was recommended your company and was so happy so I will be sure to recommend you to others. 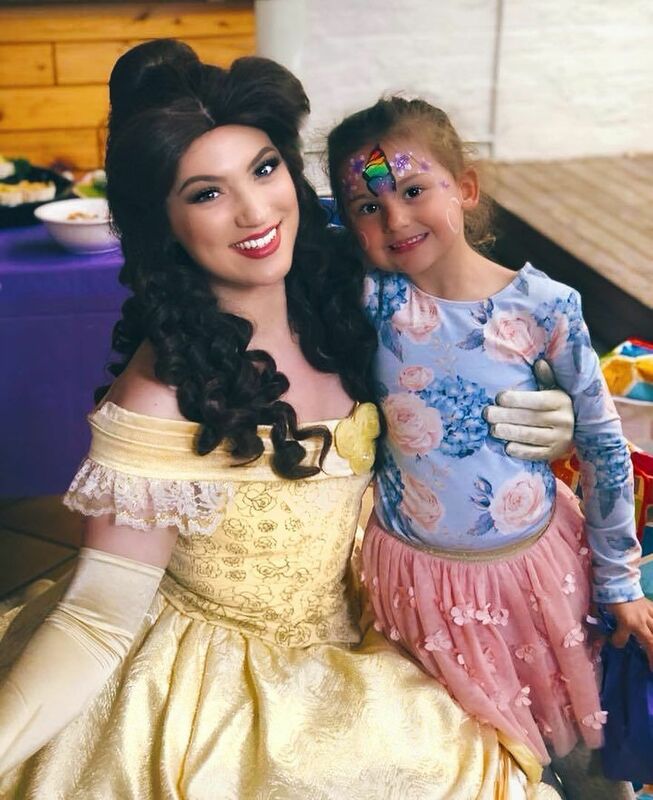 My Daughter absolutely loved having Princess Beauty come celebrate her 5th Birthday. 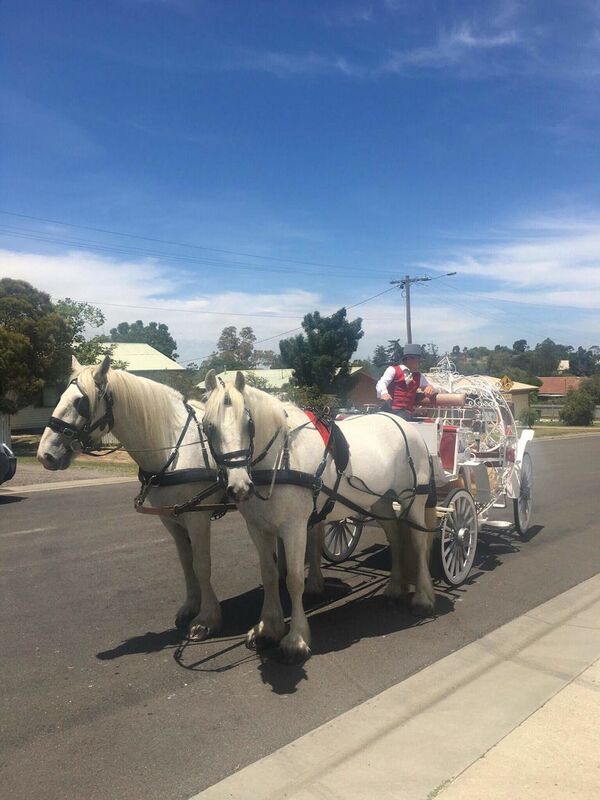 The Kids were absolutely mesmerised and enjoyed every second. 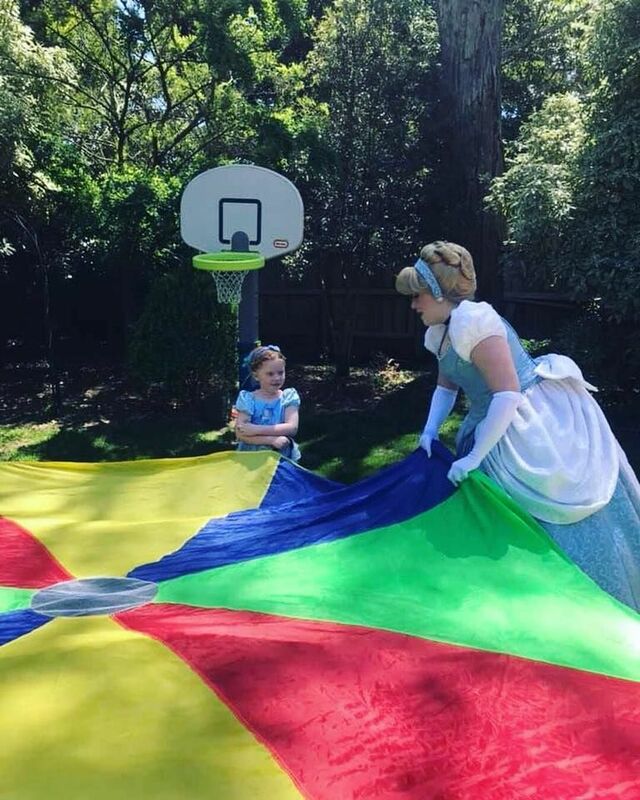 I would highly recommend Magical Princess Entertainment for your next party! 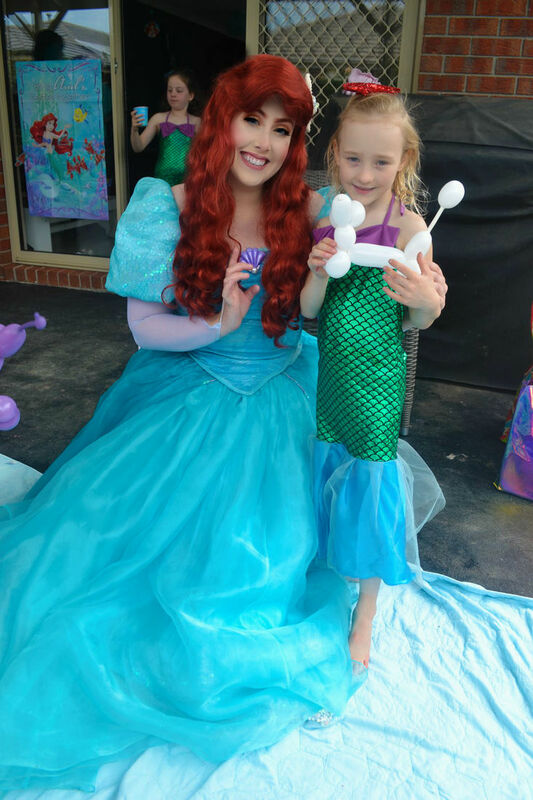 We had the pleasure of having the Mermaid Princess at my daughters 5th Birthday party. It was a sensational party enjoyed by everyone. 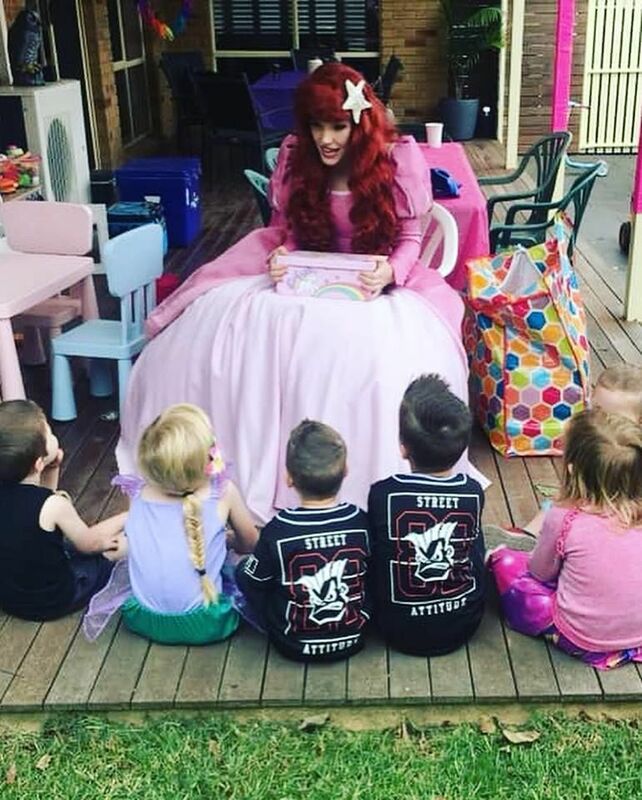 She had the most amazing singing voice and all the children were glued to her. 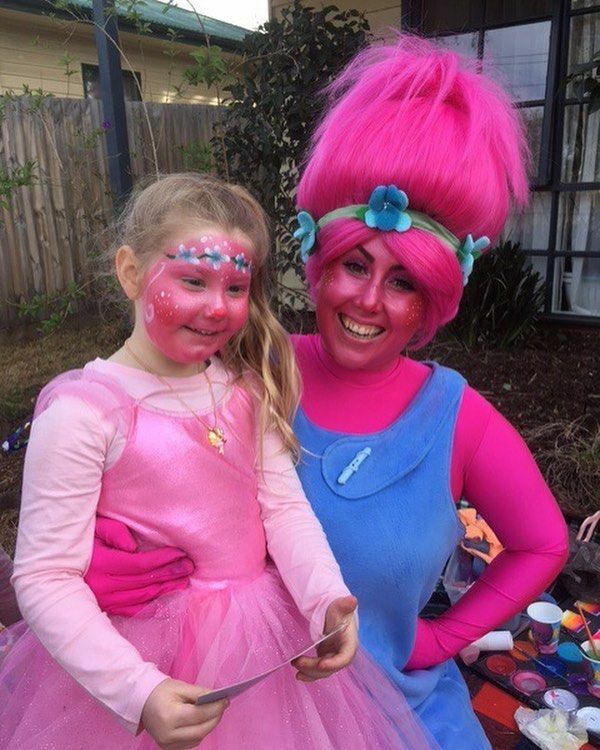 The face painting and activities were fabulous. 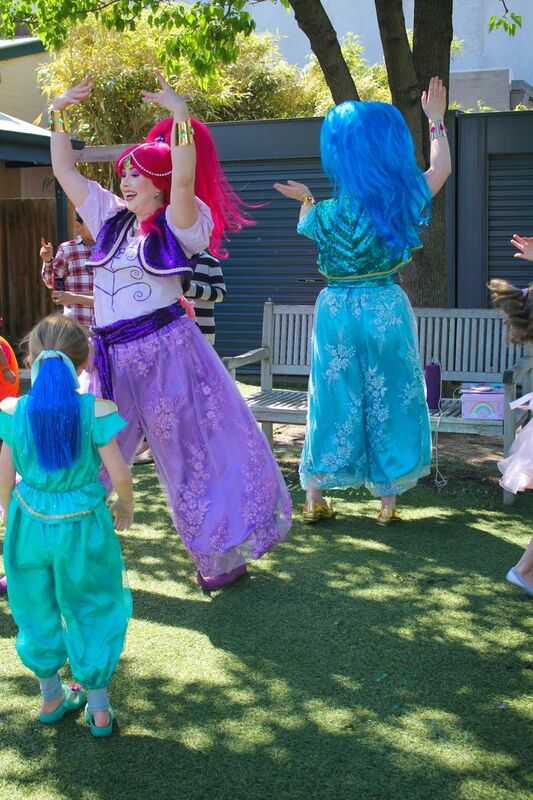 Thank you Magical Princess Entertainment, couldn’t recommend you high enough! 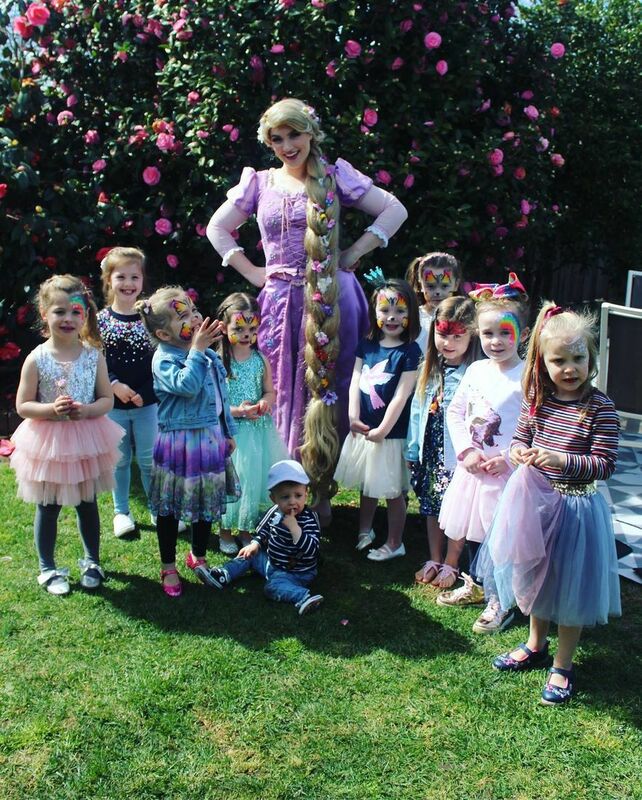 Annabelle had an amazing 5th Birthday party Thank you!! 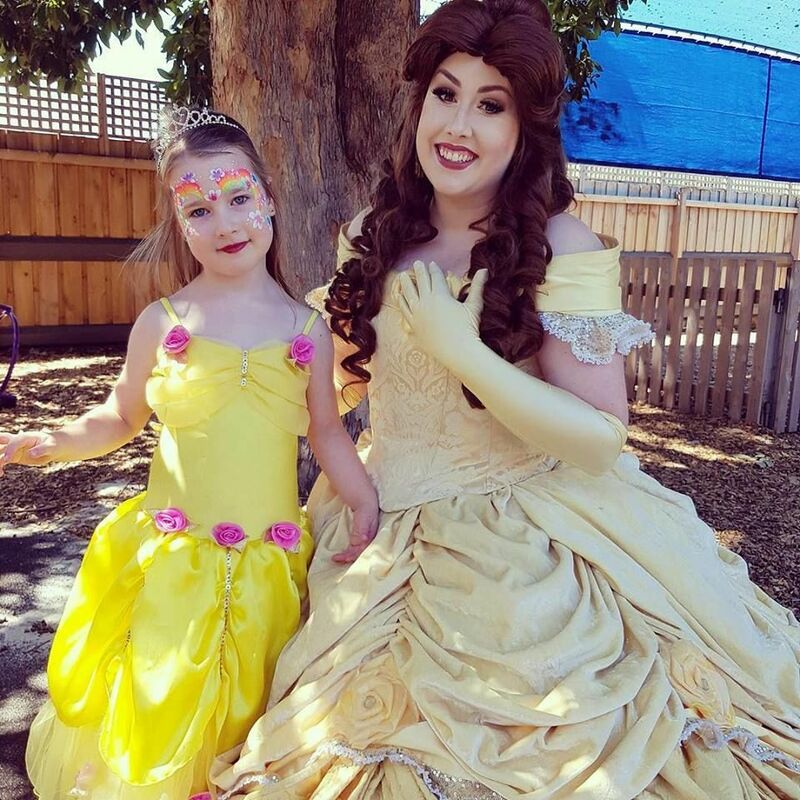 Everyone loved Cinder Princess! 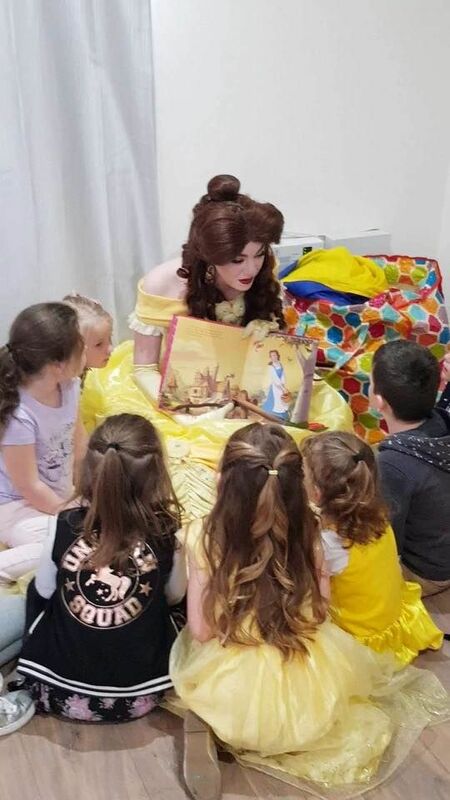 She was wonderful, kept all the children entertained for the 2 hours, they all loved it. 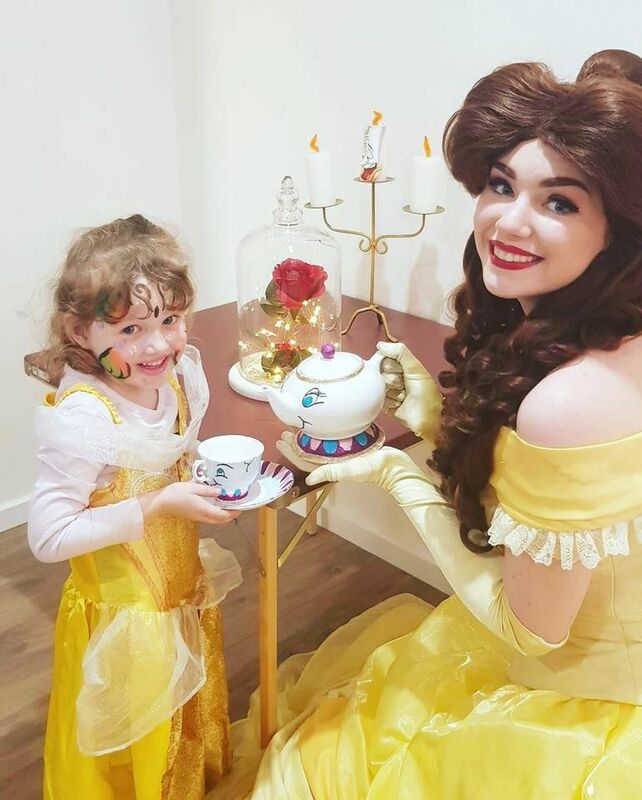 We have been to a few parties with a princess entertainer, but your company has been the best especially in regards to the quality of the entertainment, games and the outfit too!! 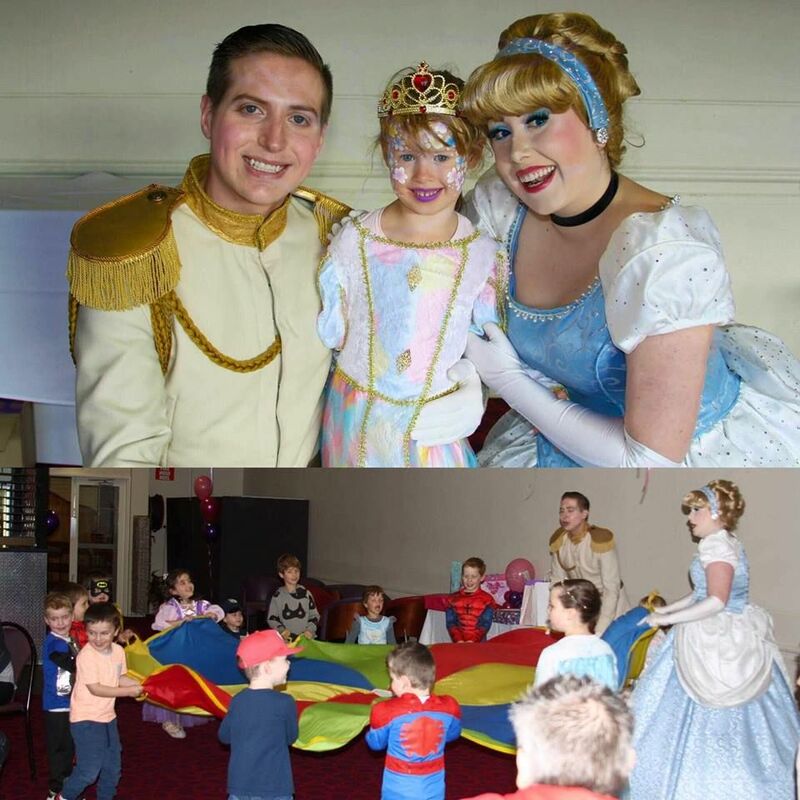 "Cinder Princess and Prince Charming were absolutely outstanding for our daughter Hannah's 5th Birthday. 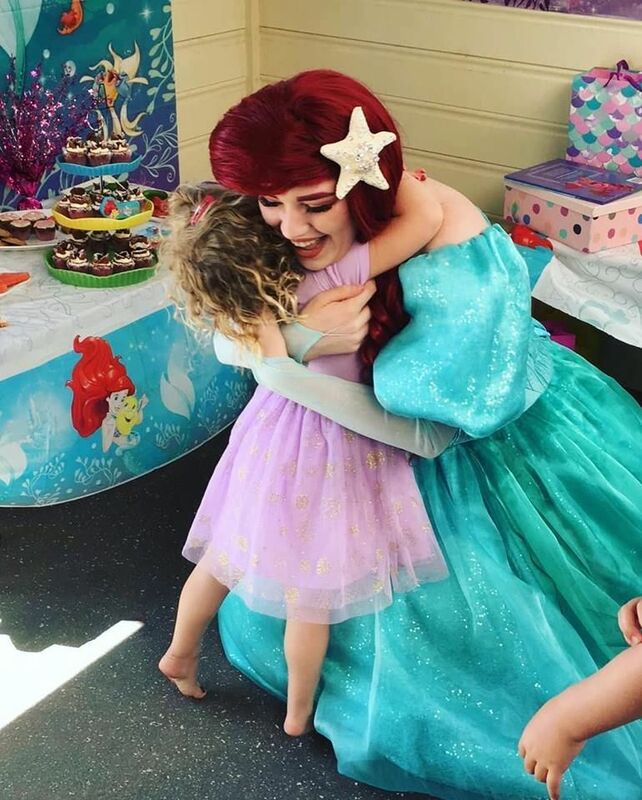 Thank you so much for making her day that extra special. Highly recommend your service as nothing was overlooked and the process was just so easy. Thanks again! Thank you again for the wonderful job that you all do. 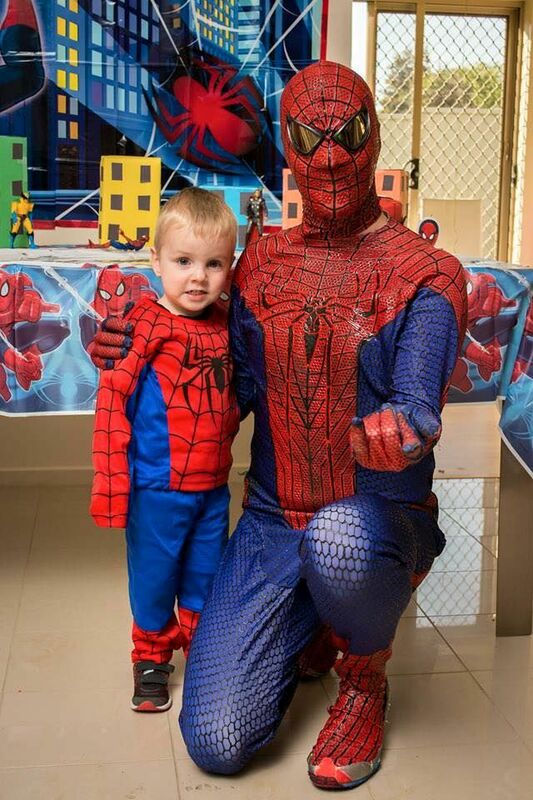 I recommend to everyone just so good xo"
Thank you so much for Spider Hero coming to help celebrate Jack's 3rd birthday. 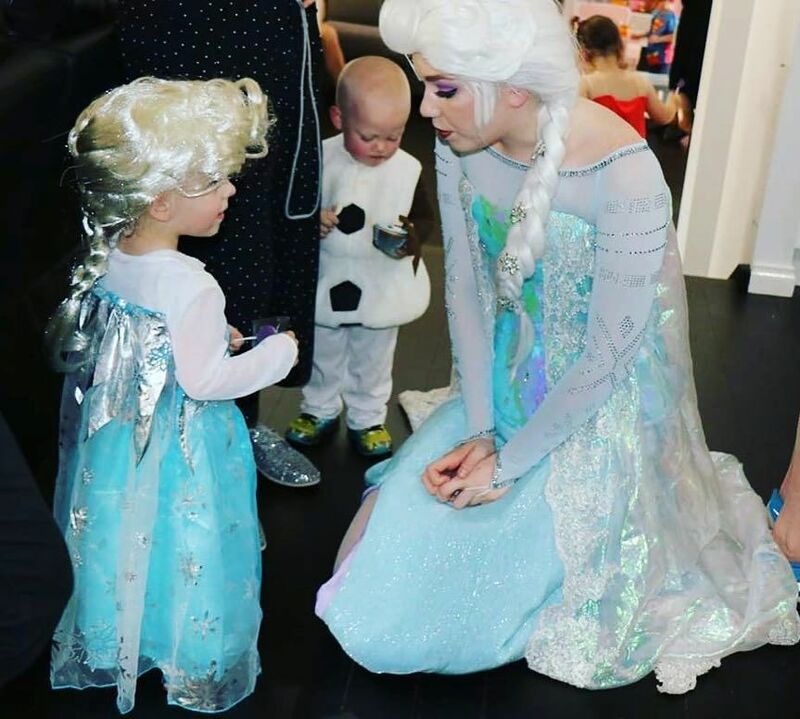 The children absolutely loved having him there and Jack was ecstatic. 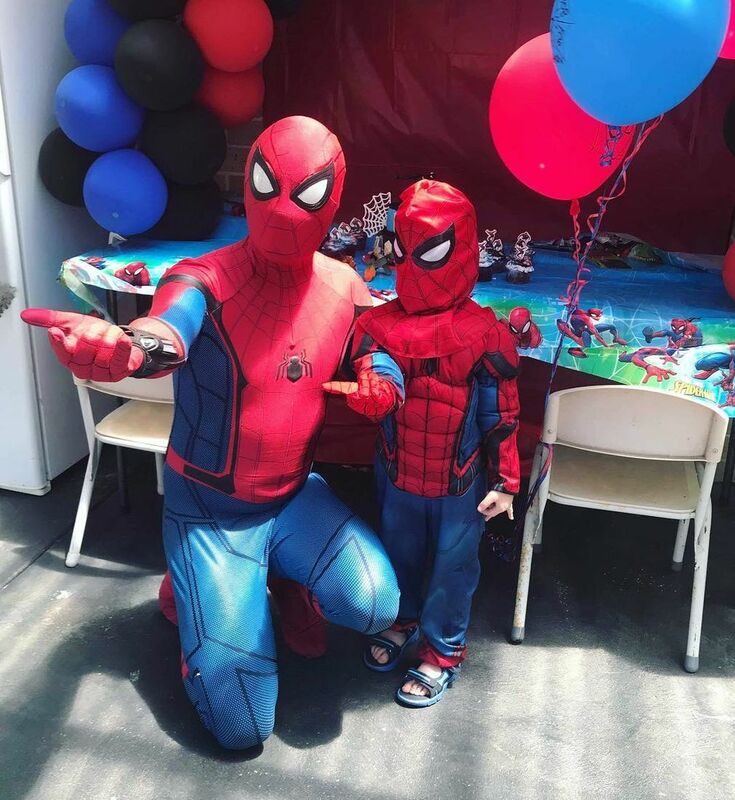 He is still talking about how the 'real Spider Hero' came to his party. 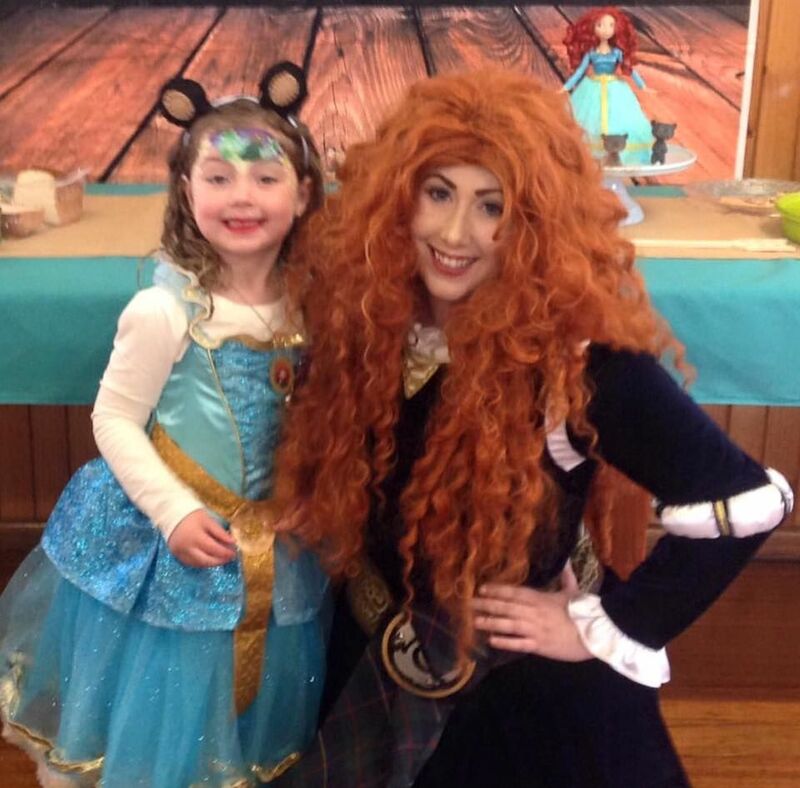 "We had the Highland Princess come to my daughters 4th Brave Party and she was absolutely amazing! 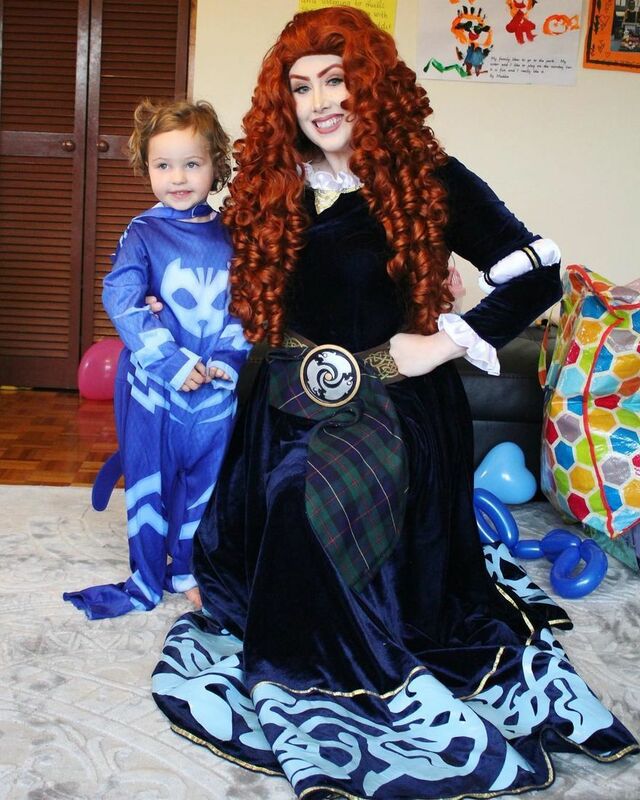 The Highland Princess is from Scotland and her accent was great! 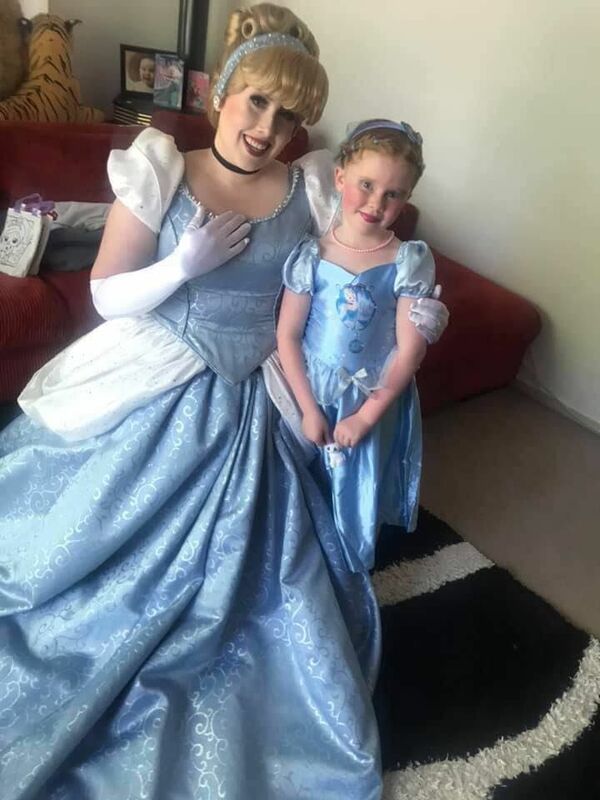 The kids had a ball, the face painting was gorgeous (my daughter requested a the Scottish Princess on a moonlight plain and that's exactly what she got! ) 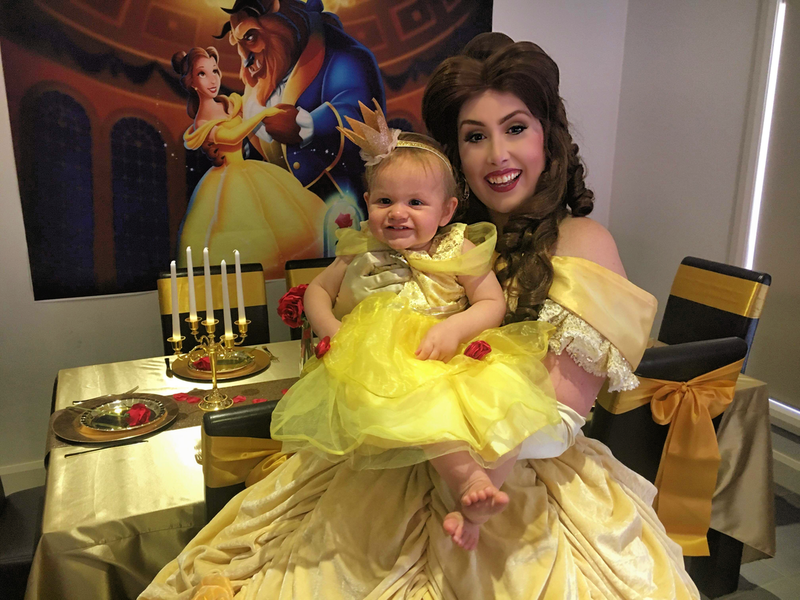 thank you so much for helping make her day super special and I will definitely recommended Magical Princess entertainment! 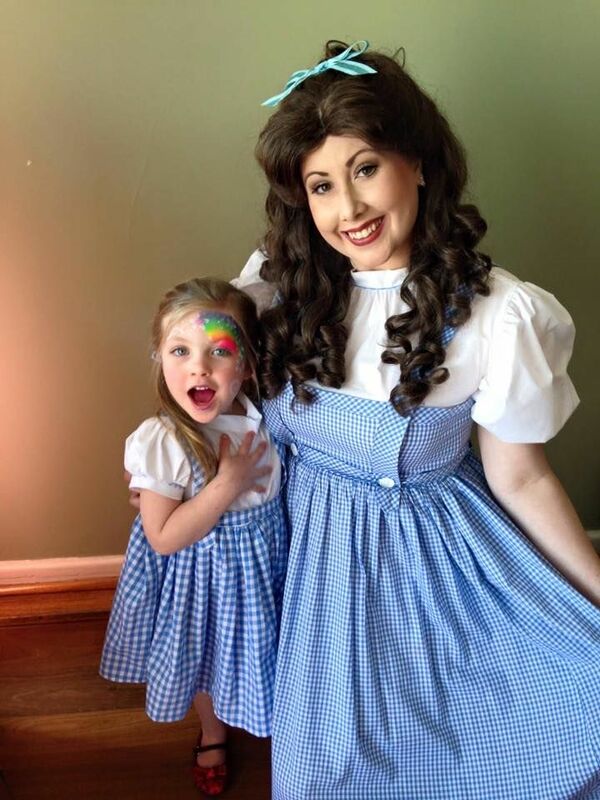 Xo"
Thank you to Dorothy for such an amazing party. The children were completely mesmerised, and Miss S informed me this morning that we needed to go to Kansas right now to see Dorothy again! Thankyou so much once again for an absolutely mesmerising experience as the Mermaid Princess. 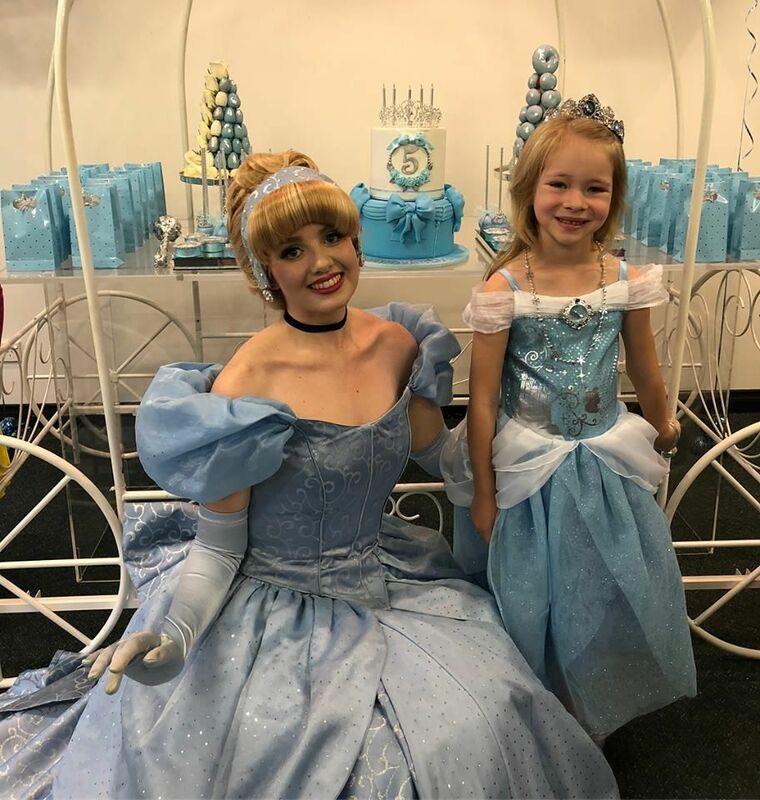 We celebrated Graces 5th birthday and she couldn’t have wished for anything more than to share her day with you.She’s been waiting for her turn of having a princess here since her older sister Tahlia had Princess Beauty last year. Also an amazing party. 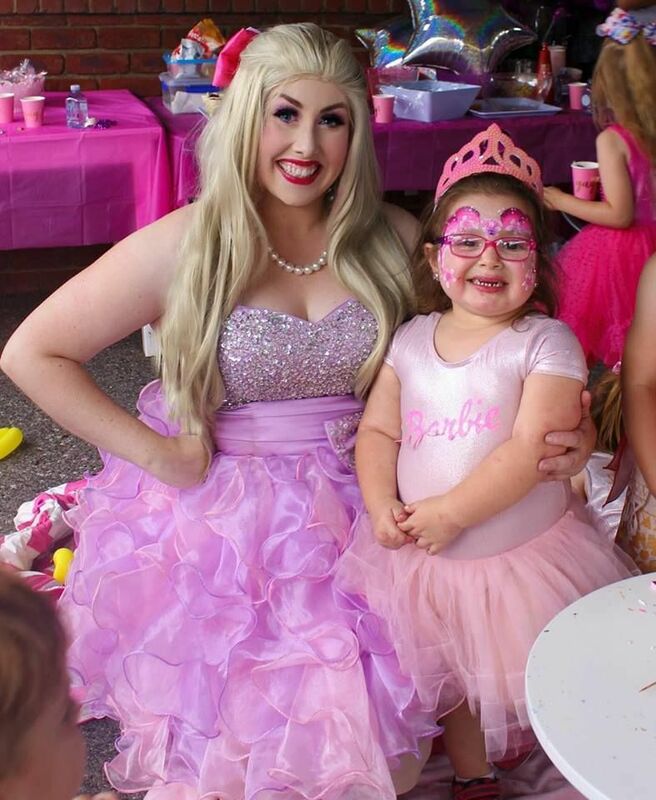 Thank you for making Chloe's 3rd birthday ultra special! 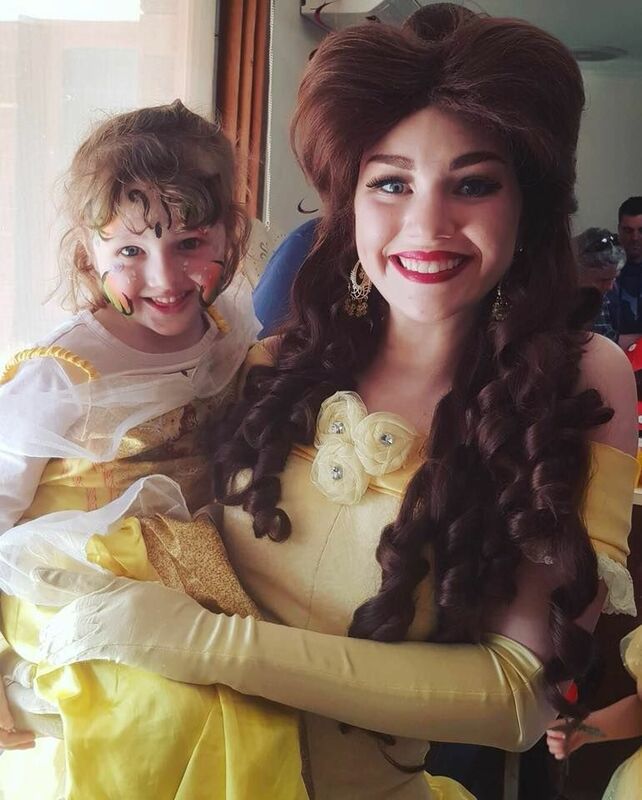 The Tower Princess was amazing, the kids loved her and had so much fun. 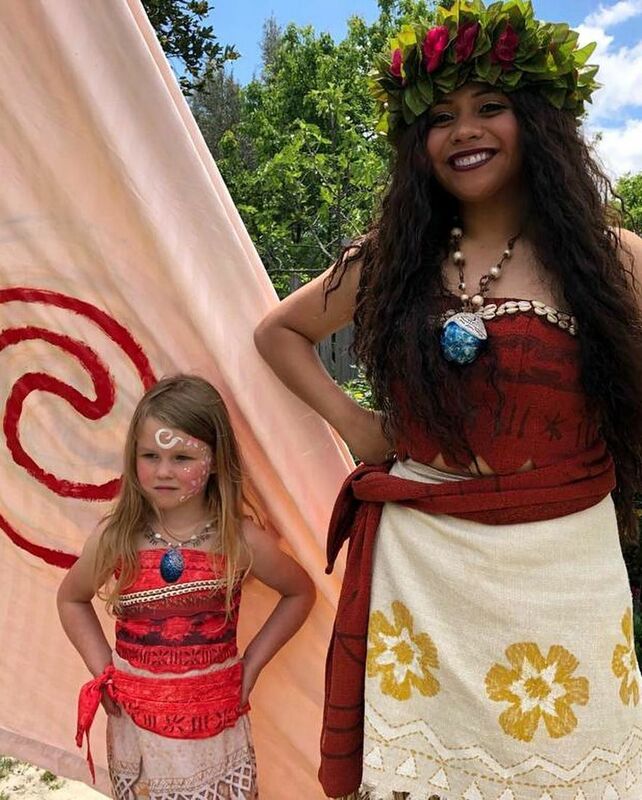 The activities were great and the face painting was beyond beautiful. Thanks for blowing my daughters mind!!! 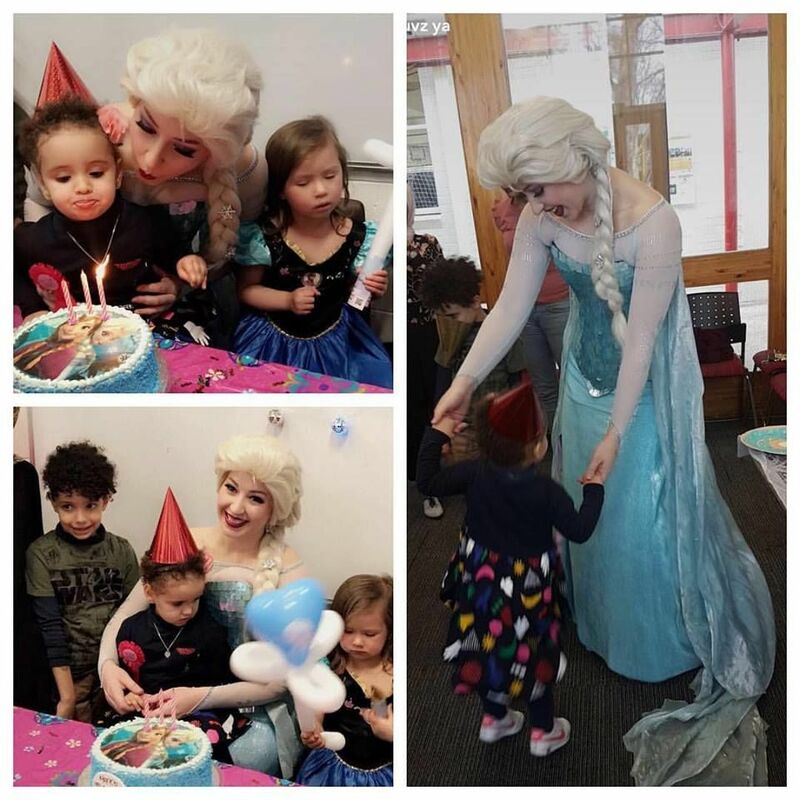 We were so delighted to have The Snow Queen join us in celebrating our daughter's 7th birthday. 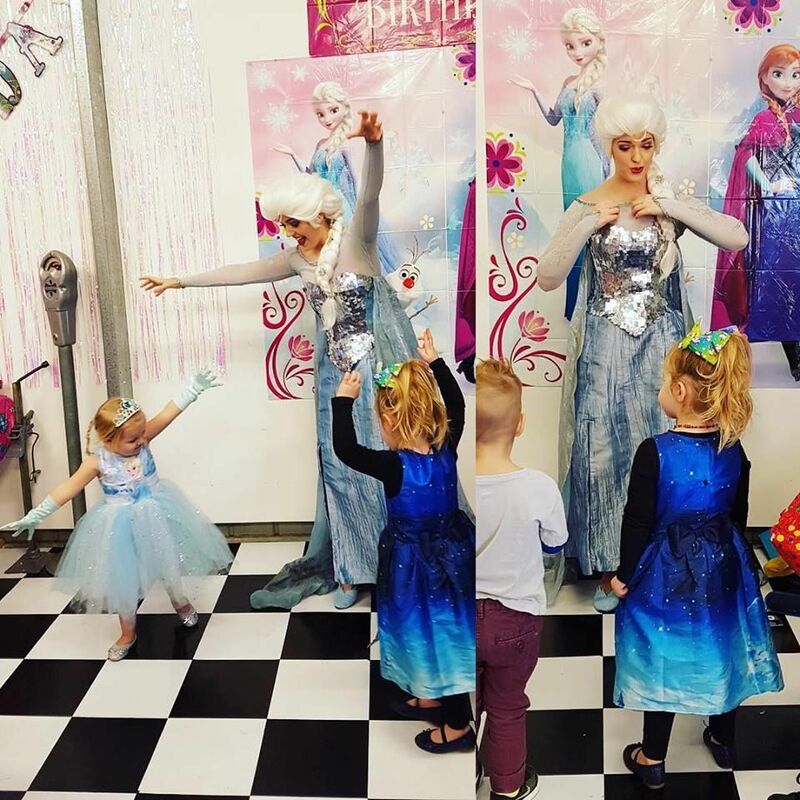 Thank you snow Queen for entertaining our guests, you were amazing! 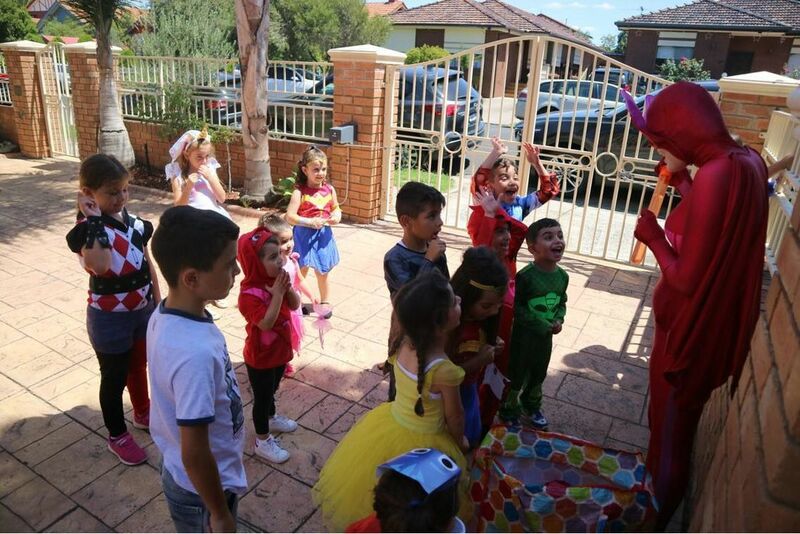 The kids surely had a lot of fun with the games, balloon twisting, face painting and story-telling. 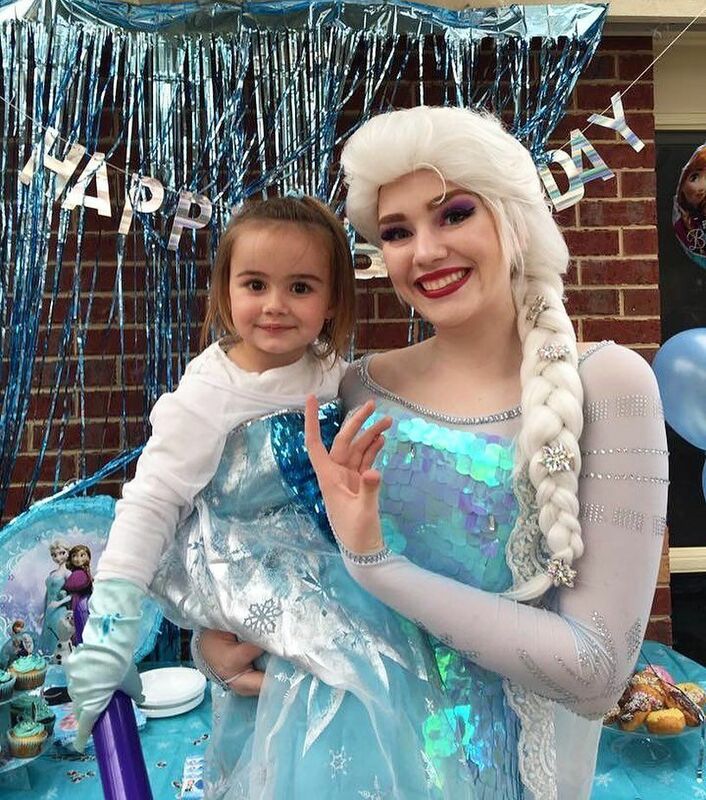 My daughter loved that she was able to sing-along with The Snow Queen on her birthday. Thank you, Magical Princess Entertainment for the accommodating us given our short notice and for making our booking with you such a breeze. Thanks so much and a job well done"
The Snow Queen was amazing!!! 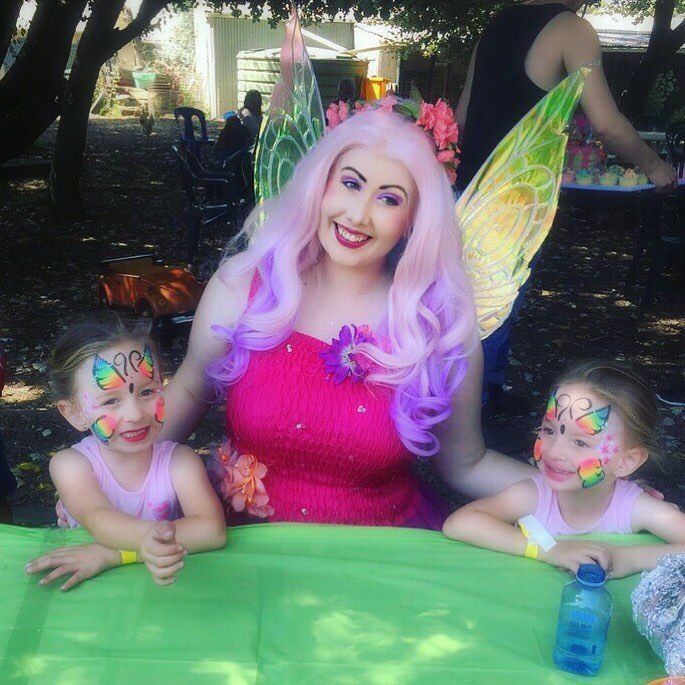 She had the children (and adults!) engaged right from walking in and greeting the birthday girl!!! I was so impressed with how patient she was and how well she interacted with the children especially when some were quite shy. And her face painting was exceptional!!!! 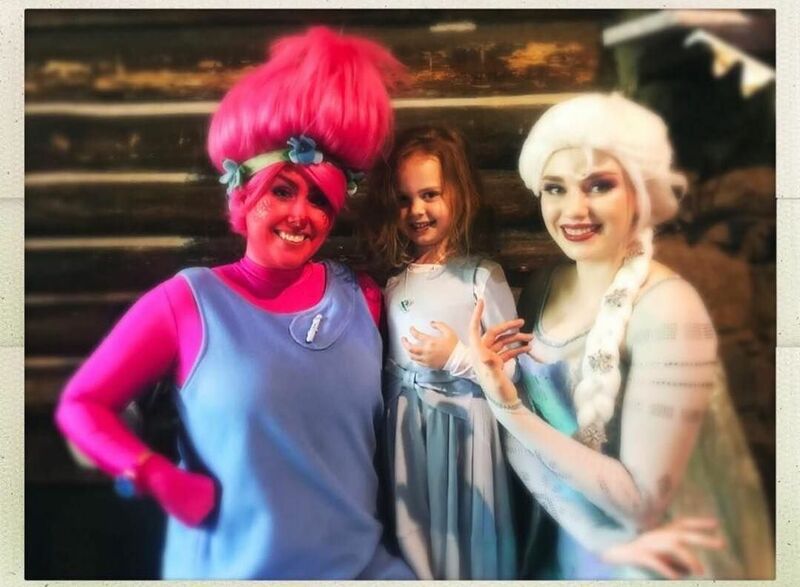 From the beginning she was in character which was fabulous when my daughter asked where Anna was and she said she was at the castle in Arendelle, I was so impressed! 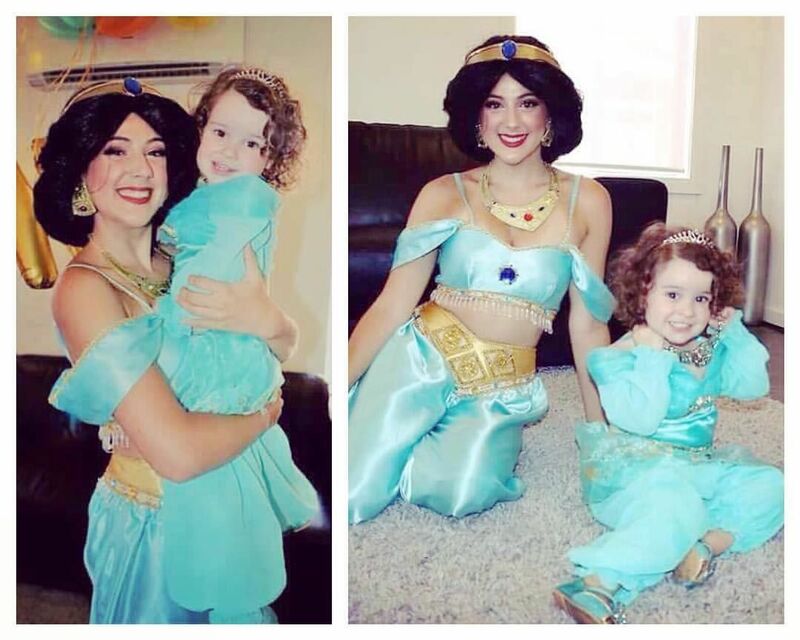 I would highly recommend your princesses to anyone and won't hesitate to hire again! 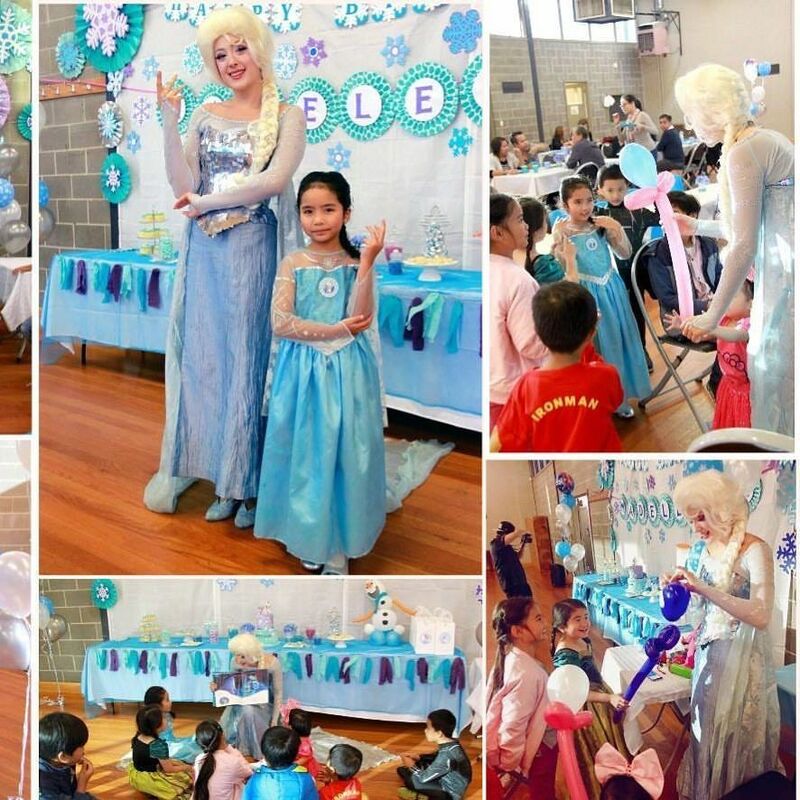 The Snow Queen truly was a delight and made our party! 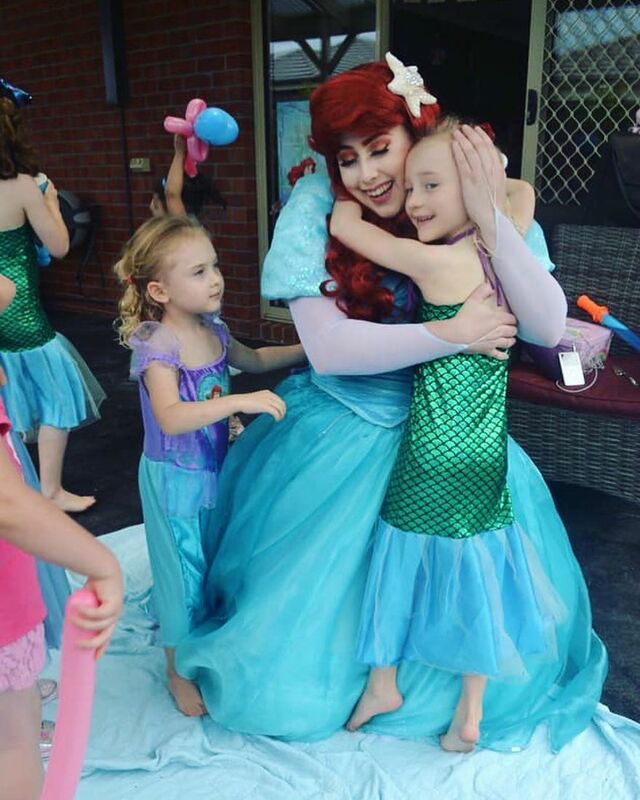 I truly can't thank you enough x"
“Words cant describe how happy the Princesses made Makayla today. 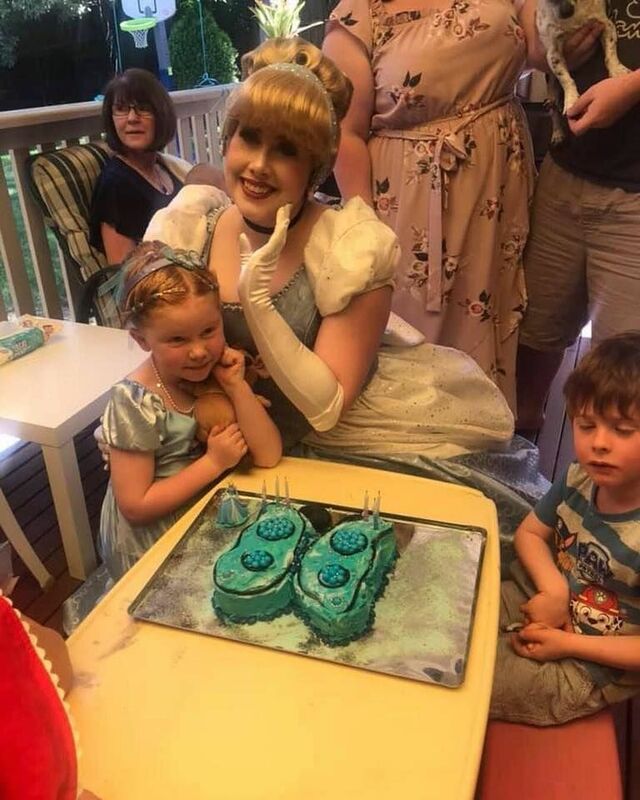 It will definately be a birthday that she will never forget. 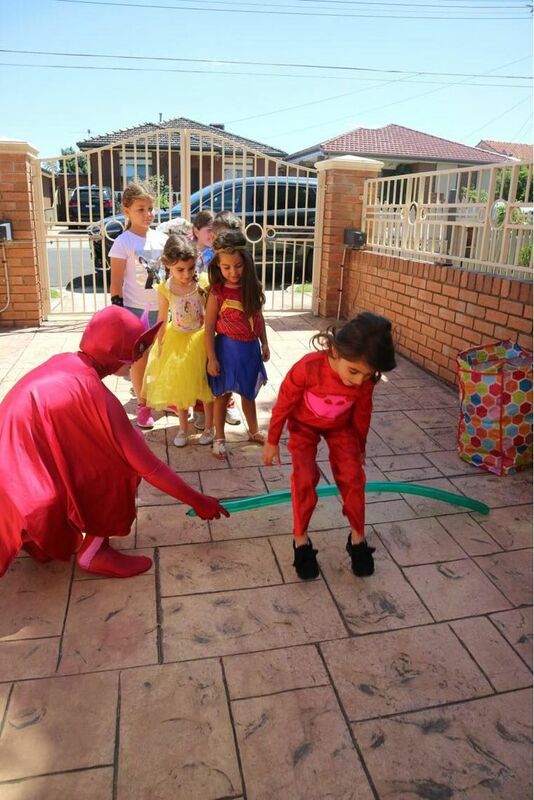 “The energy erupted when the the Pink Princess and Blue Prince came through the door and didn't stop until they finished! 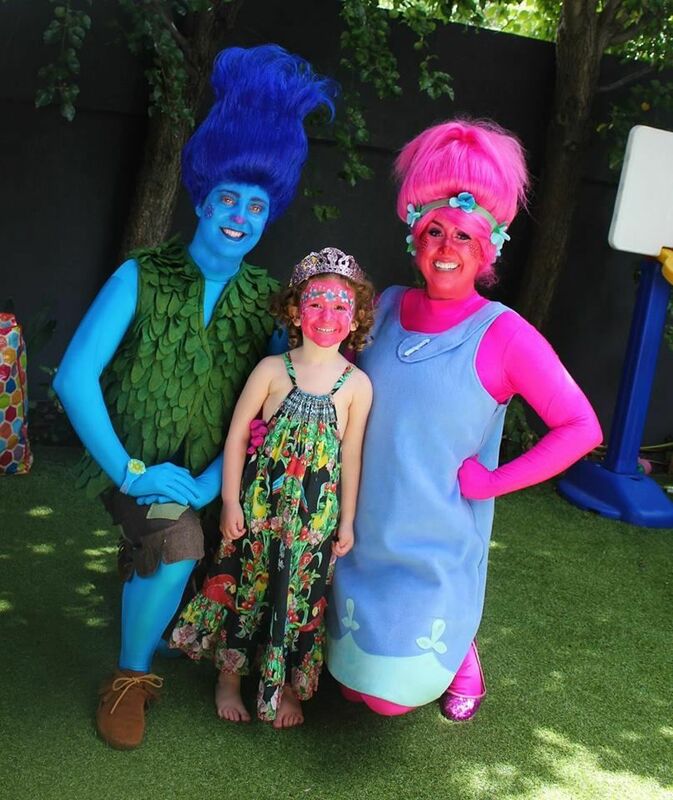 The children delighted in the characters and they had them engaged from start to finish! 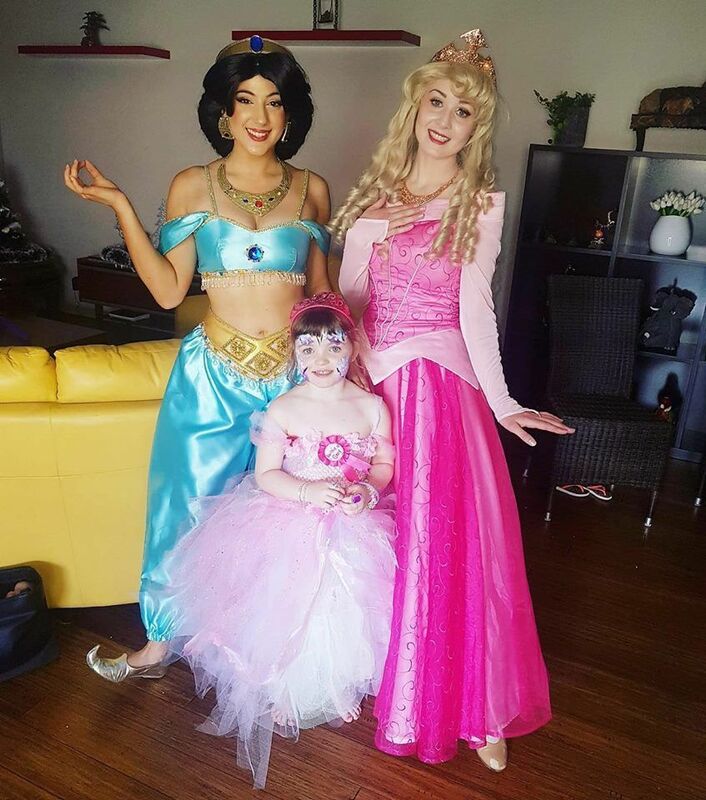 We will definitely call on Magical Princess Entertainment again! 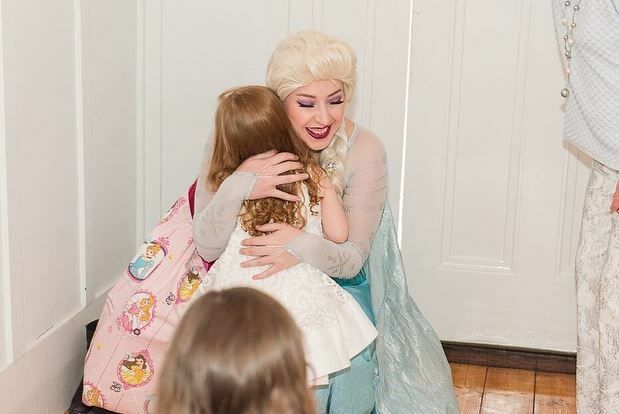 The party was wonderful, The Snow Queen was great and all the kids loved her. 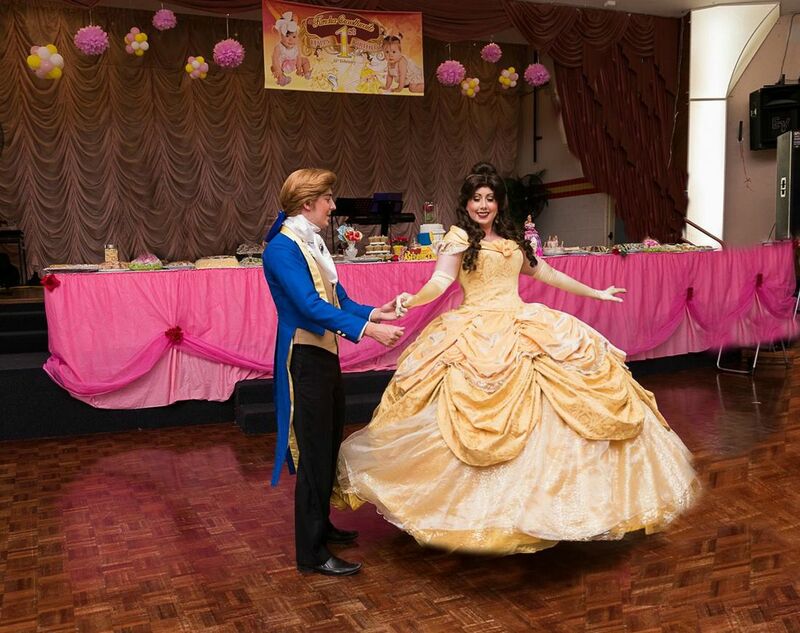 Thankyou to Magical Princess Entertainment. 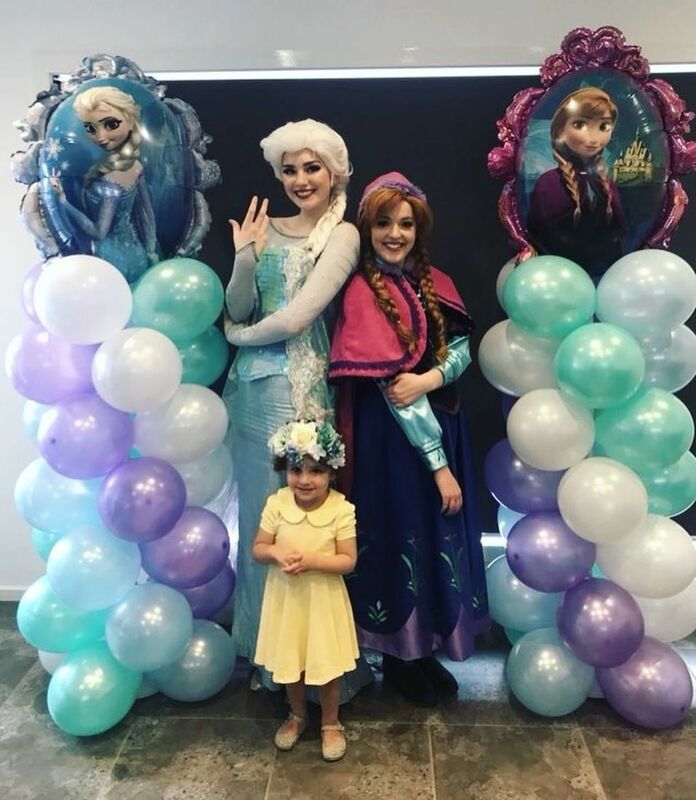 Our little Yusra had the best 3rd bday party ever!! "I just wanted to thank the Pink Princess for a brilliant performance yesterday. 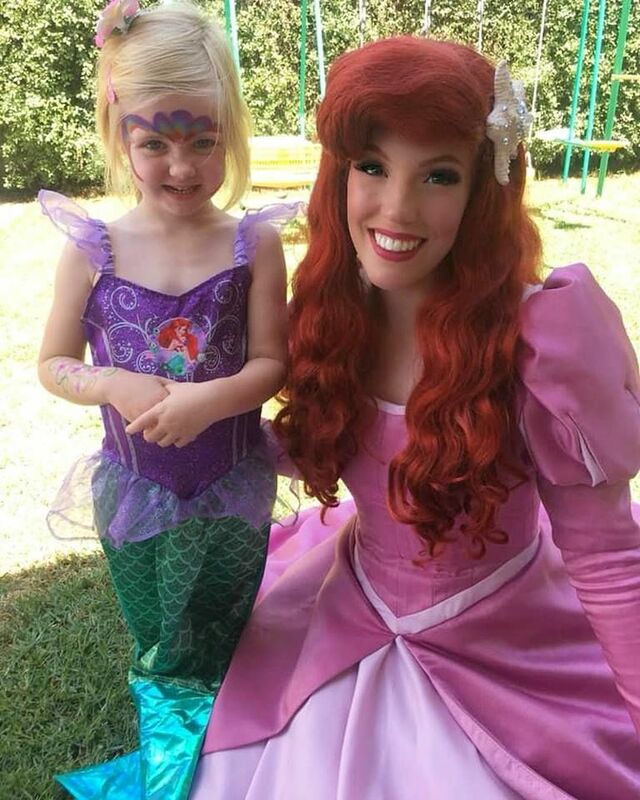 She really made Sutton's day so special. She was just brilliant. 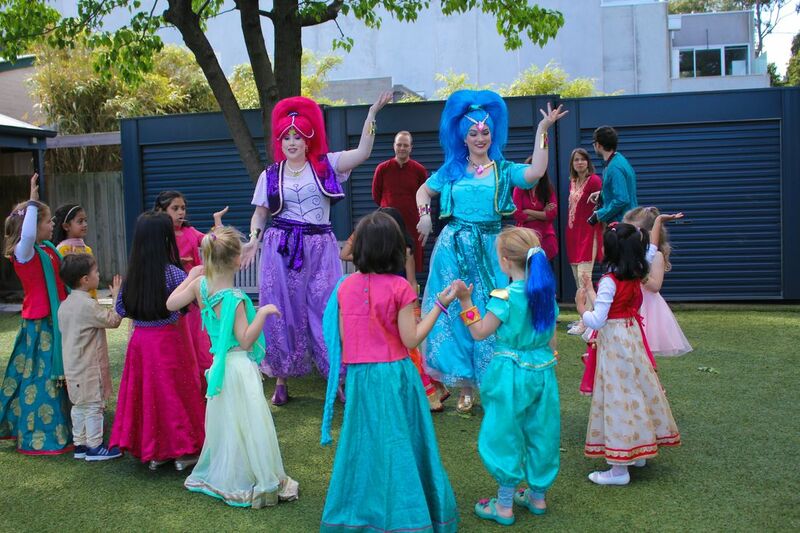 All of the children had a ball were so engaged with her warmth and charisma!! I'll be singing her praises to everyone we know." 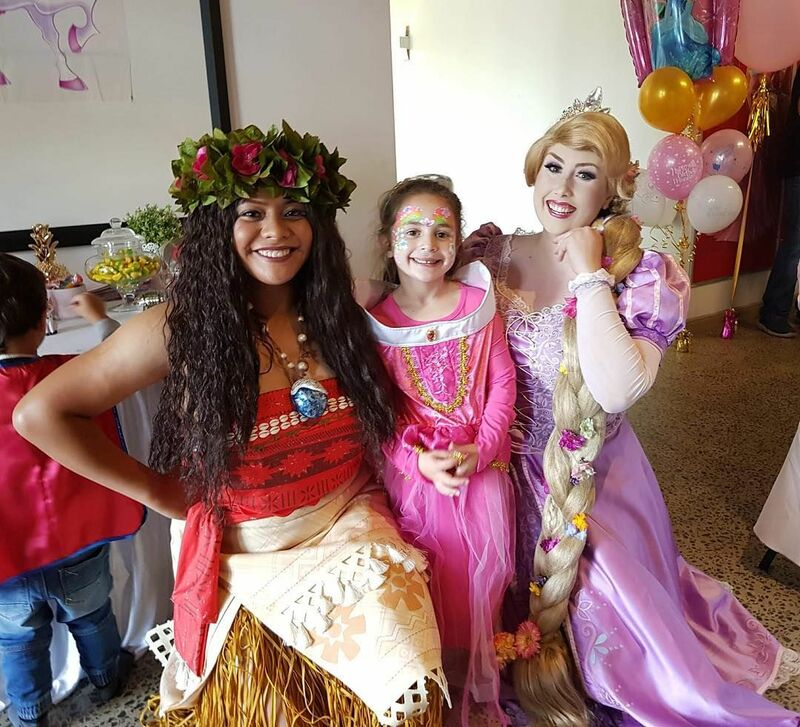 "Lara and her guests were so excited to have The Island Princess attend her 5th birthday celebration .....Thank you for helping make it a wonderful day! " 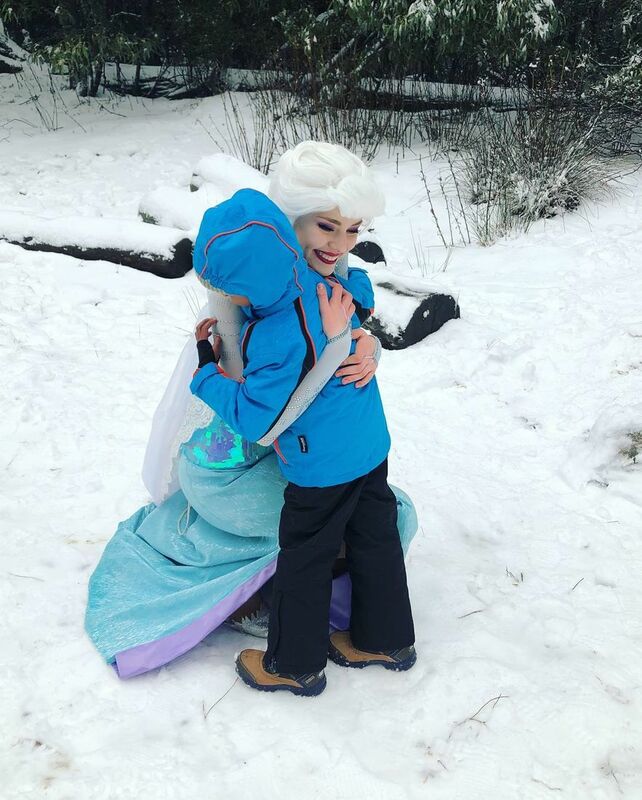 Here is one more photo of the first hug. 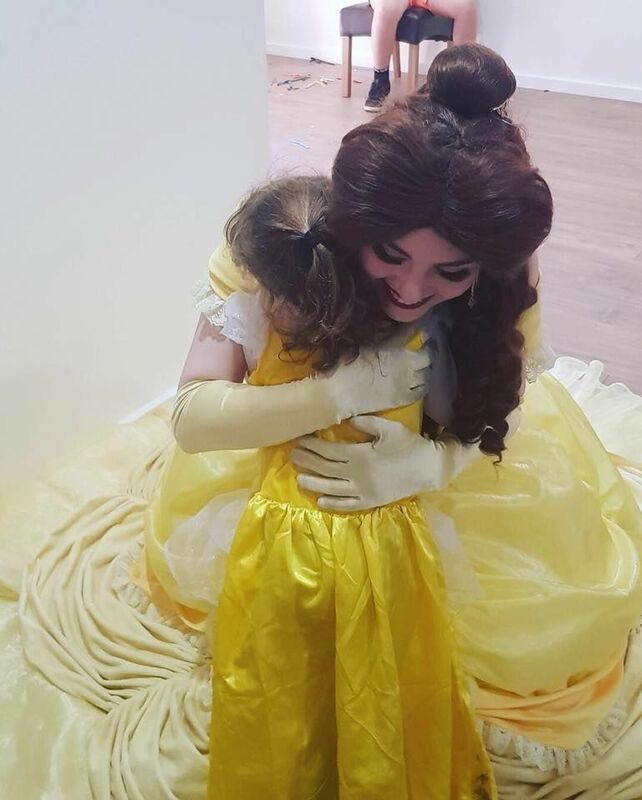 Hazel had just had an accident and we couldn't console her but then she heard Ella's voice and instantly changed back to her normal happy self. Hazel ran straight to Ella and gave her the biggest hug she could. 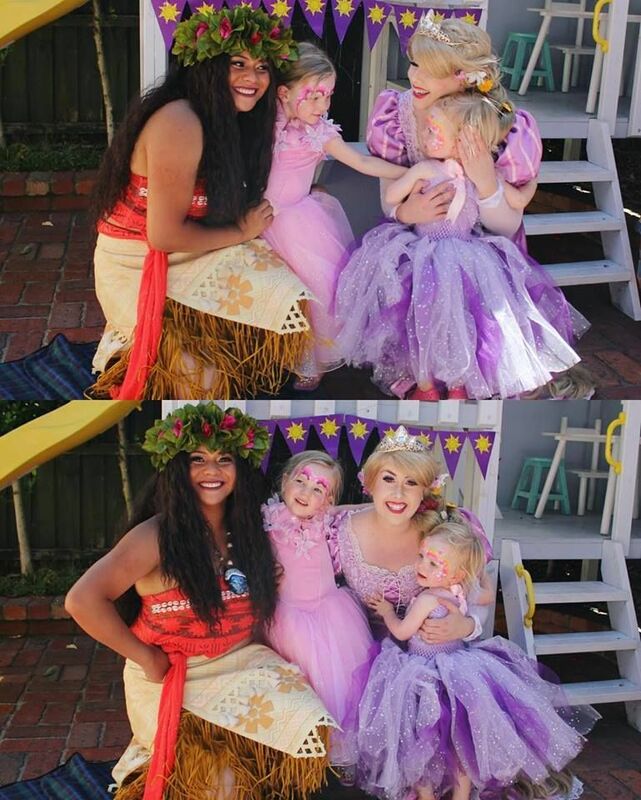 Seeing Hazel light up the way she did, in absolute awe of Princess Ella, made me teary eyed. The magic was certainly there. 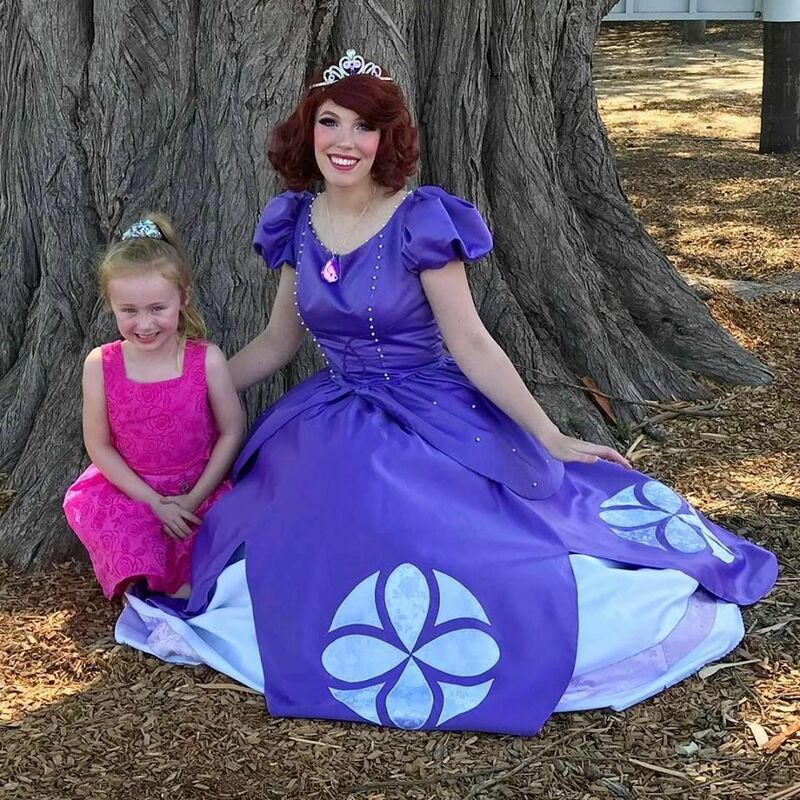 Hazel instantly needed to put on her own gown and glass slippers. Hazel did not let go of Princess Ella for the rest of the time she was here. 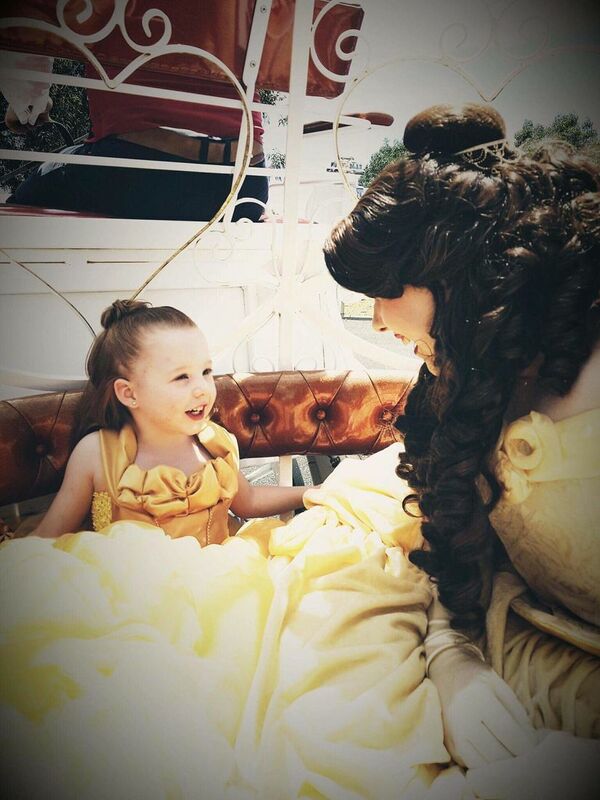 We will definitely be inviting a princess again in November. Thank you again for absolutely making our day. I just wanted to say a very BIG thank you to your company for the professional service you provide. comments from other parents today - just amazed by what you provide. Just wondering if you could please pass on my thanks and gratitude to 'Sofia'. I don't feel I was able to thank her properly and commend her on a job well done today. It was a little hectic with 20 odd adults and children. Again Thank you! 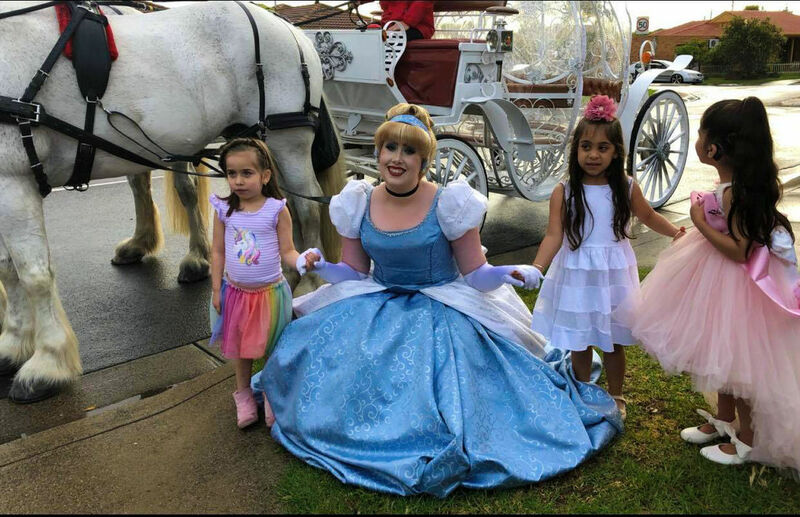 Princess Beauty was fabulous, my daughter and her friends had a wonderful time!